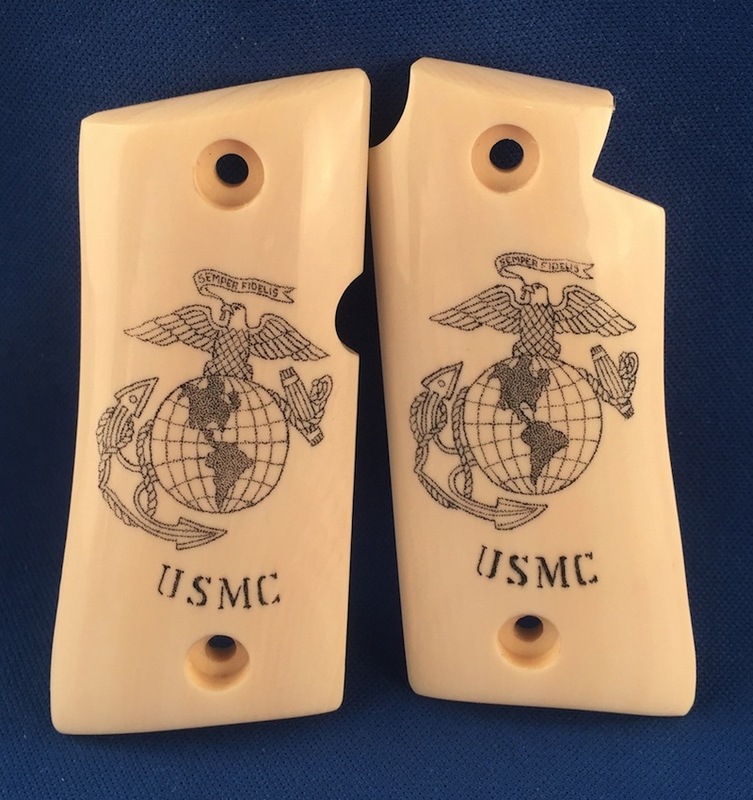 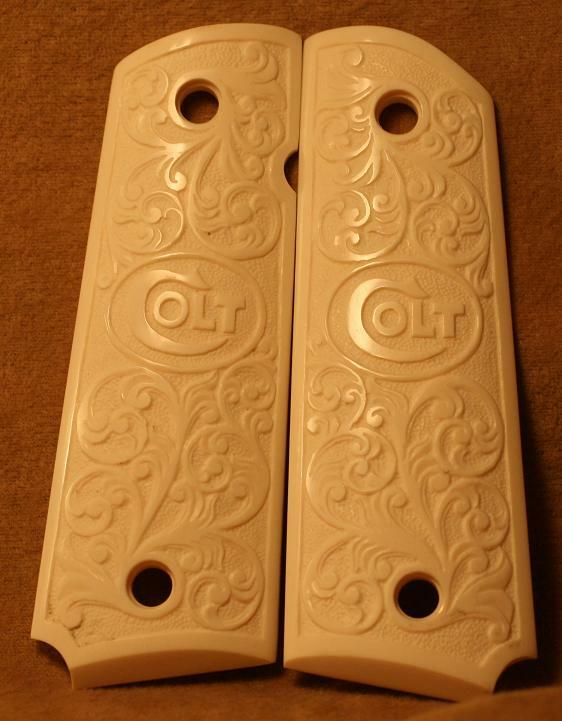 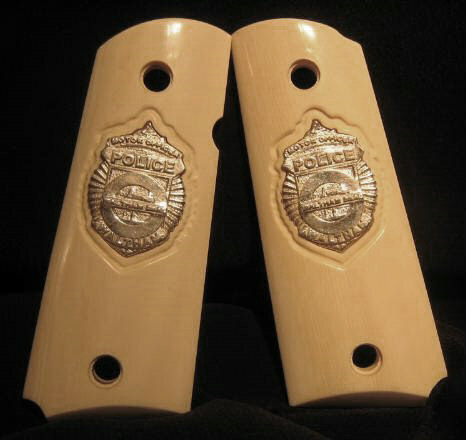 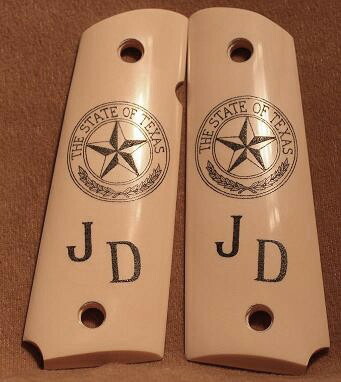 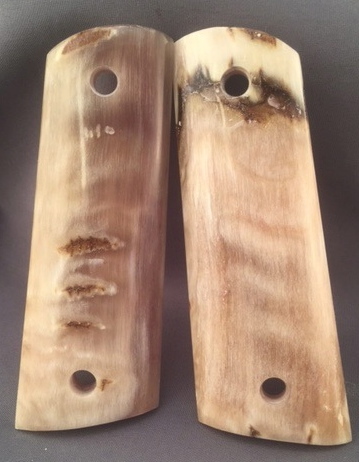 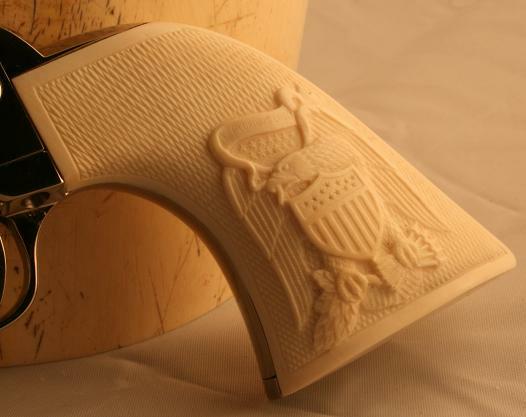 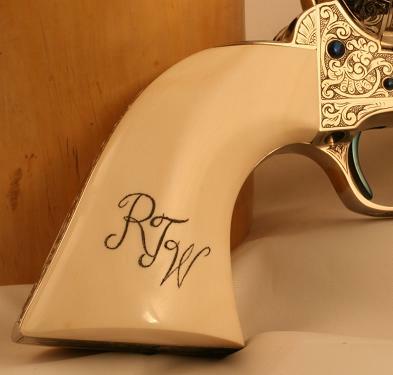 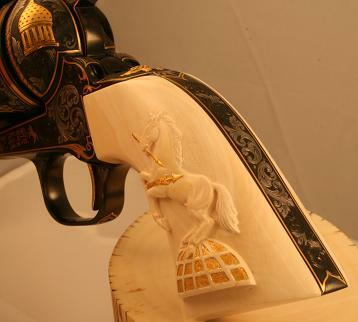 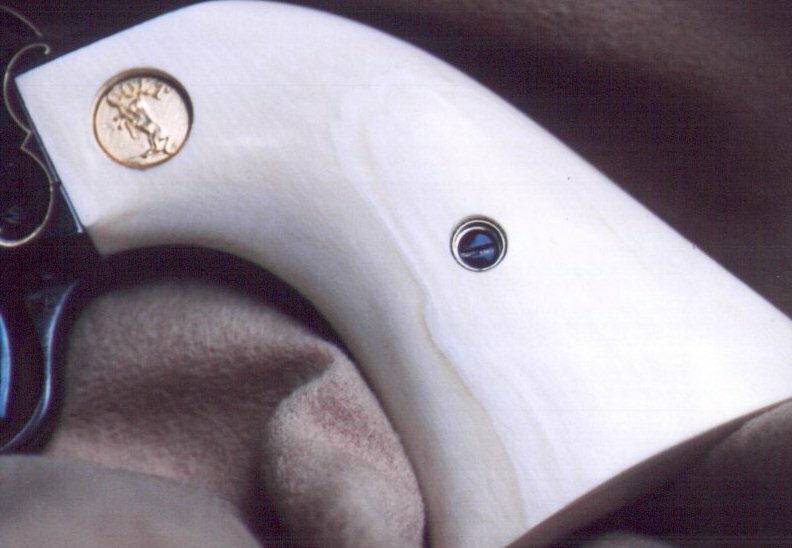 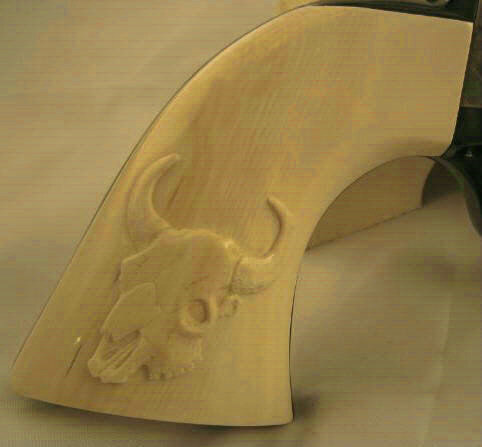 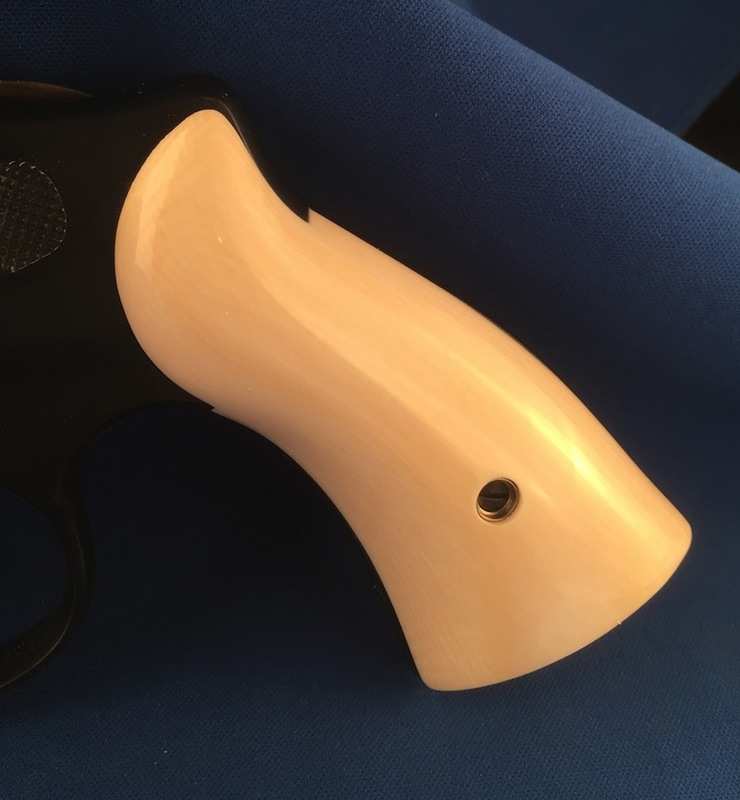 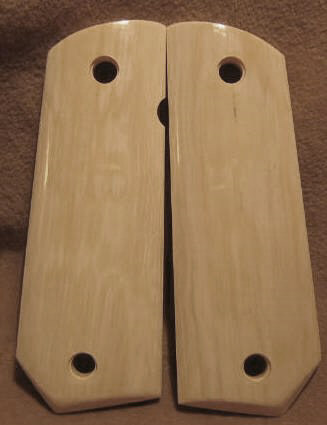 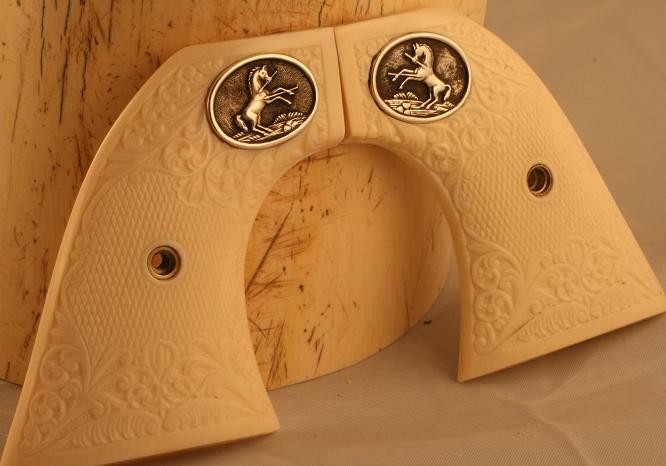 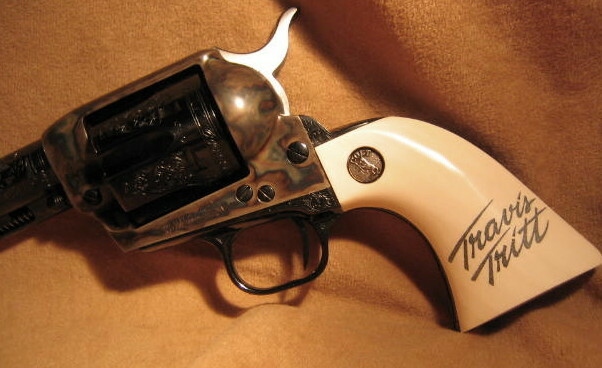 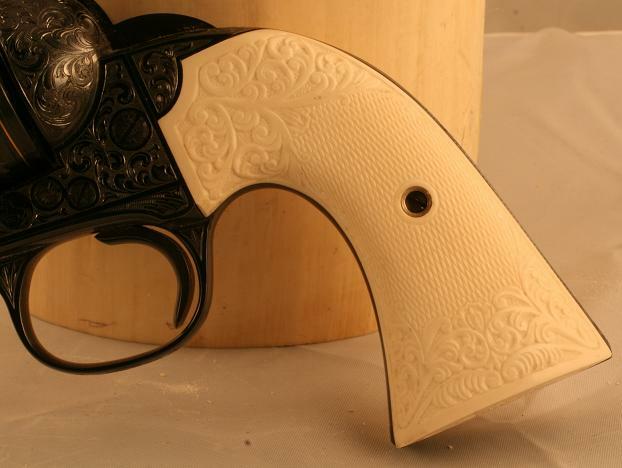 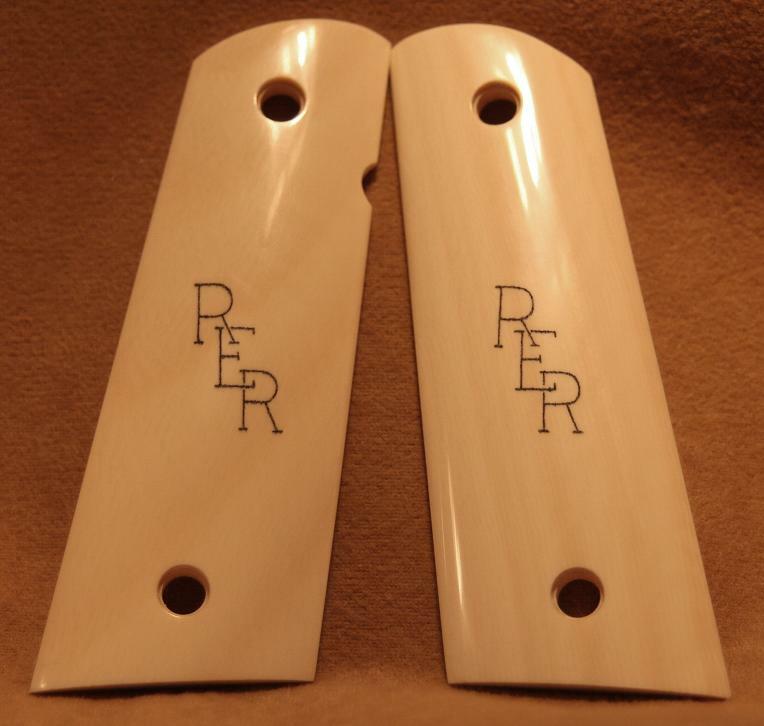 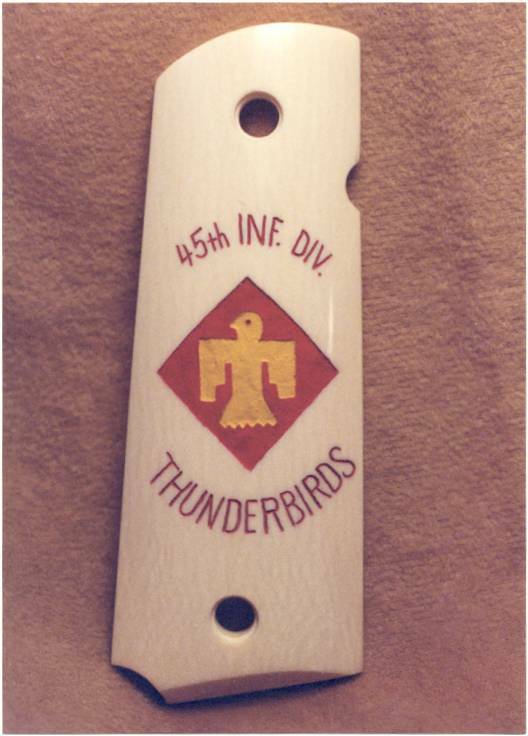 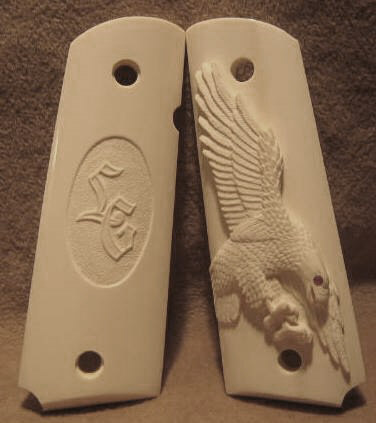 Here in our workshop we manufacture custom handcrafted gun grips. 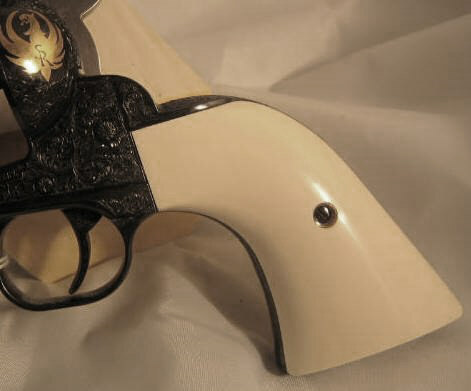 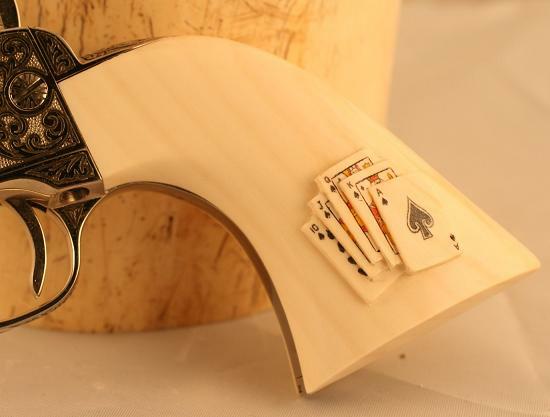 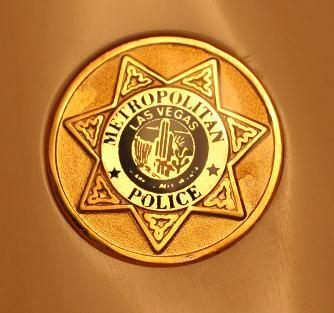 The grips are the part of the gun that connects it to the man. 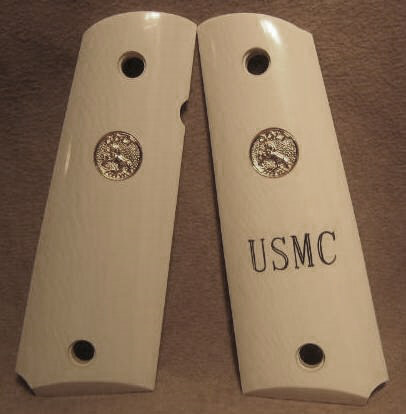 They must feel right and most of all they must be fit properly. 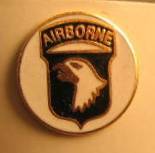 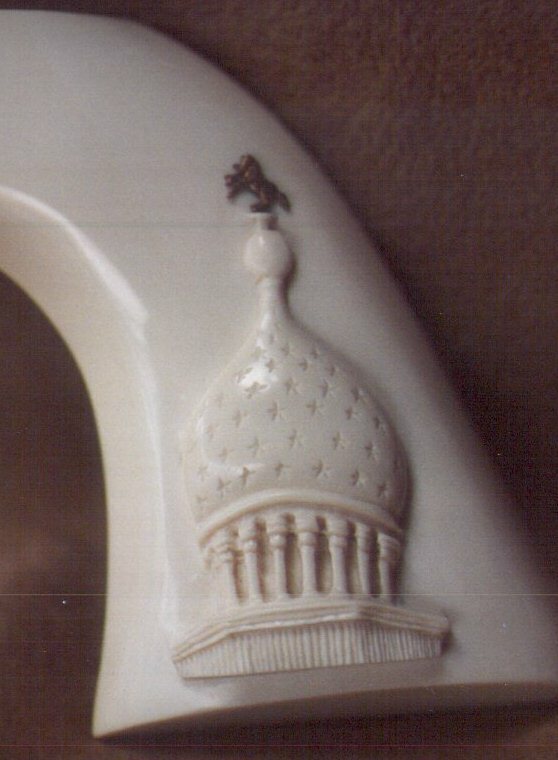 Click on images to see a larger picture! 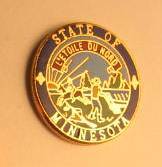 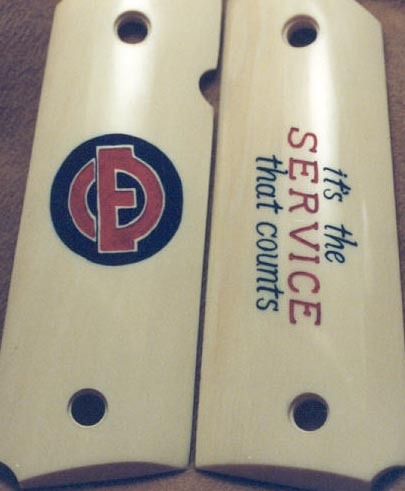 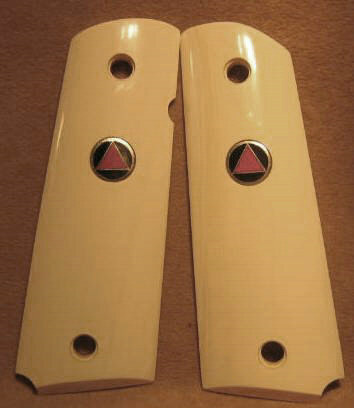 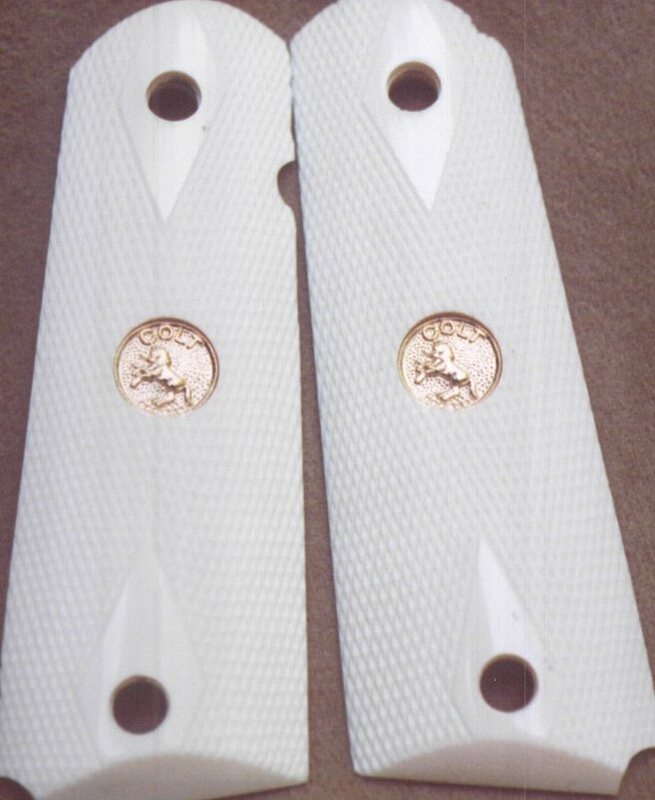 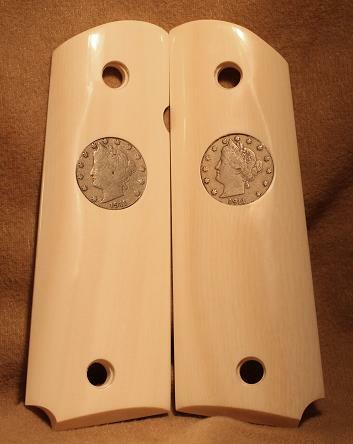 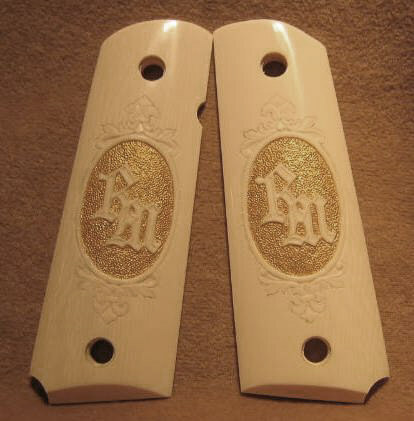 The above pictured gallery of grips and medallions is just a sampling of what we can do for you at NUTMEG SPORTS. 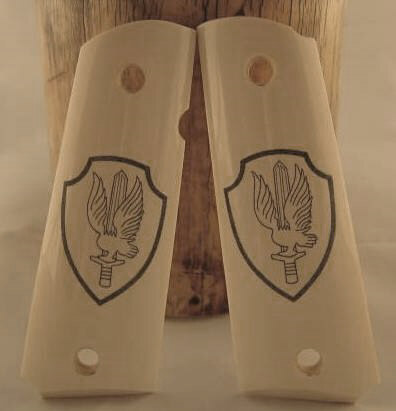 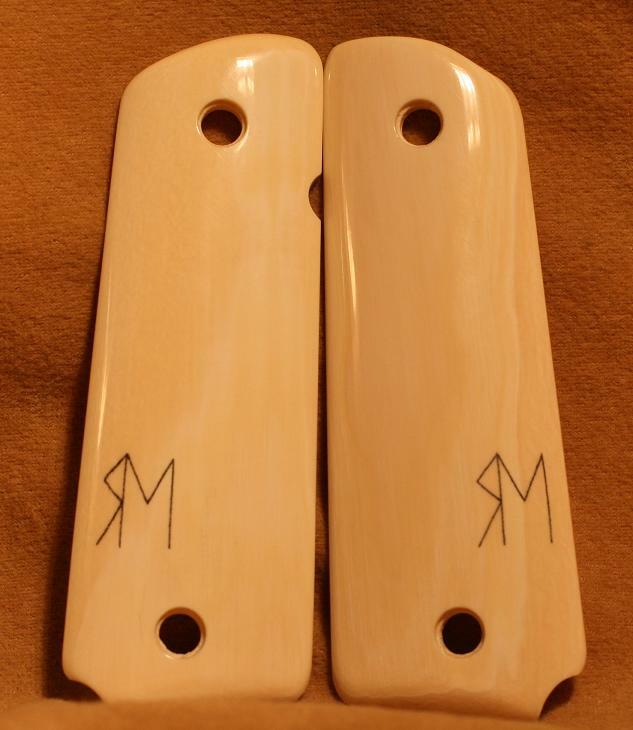 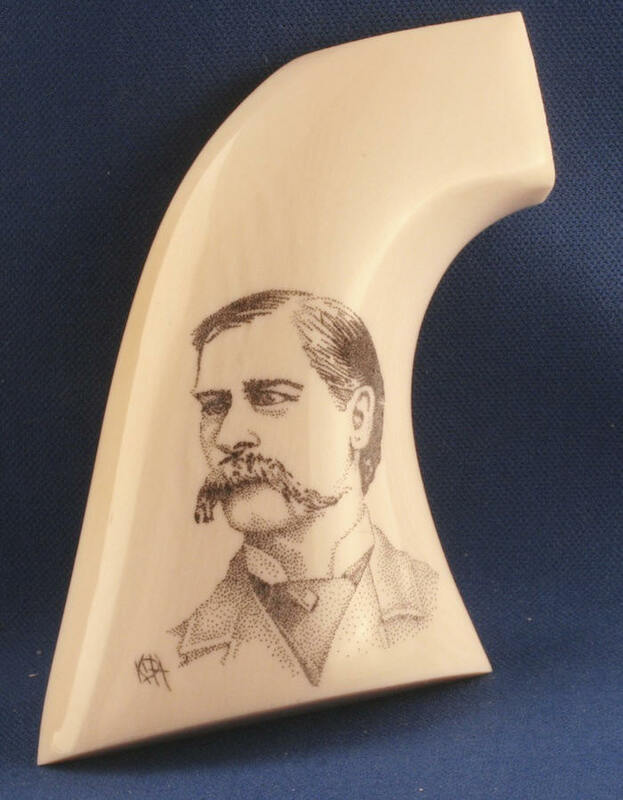 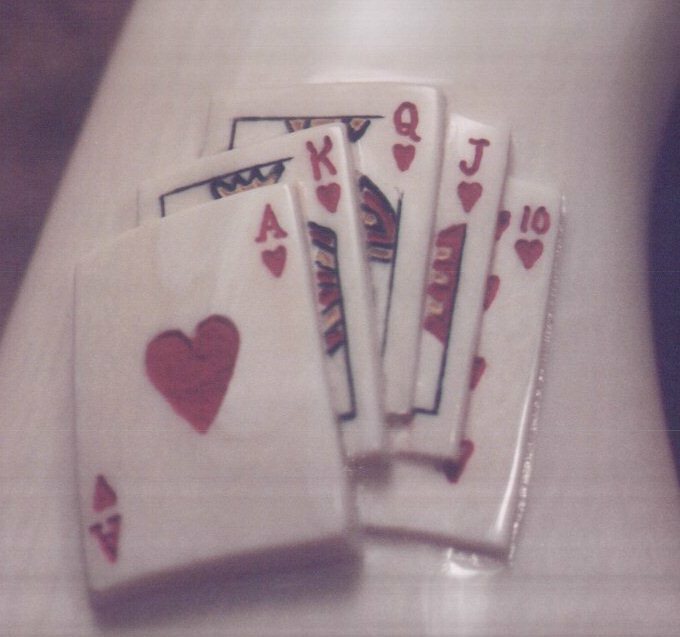 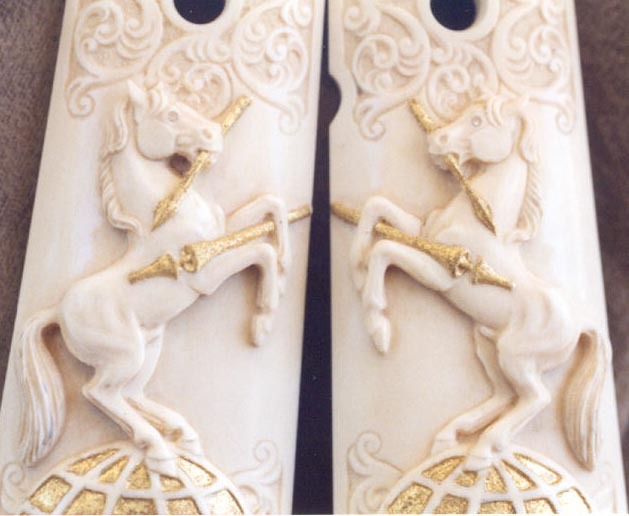 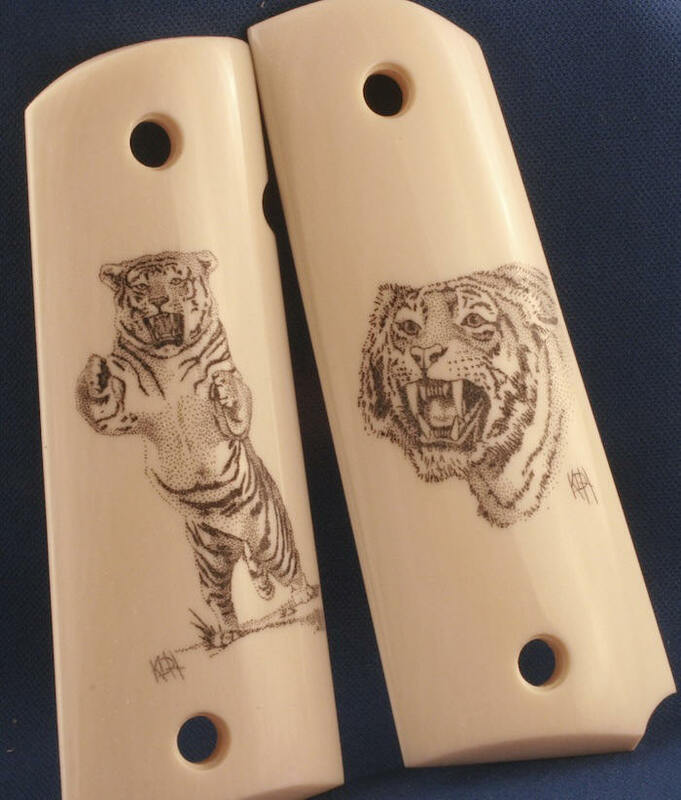 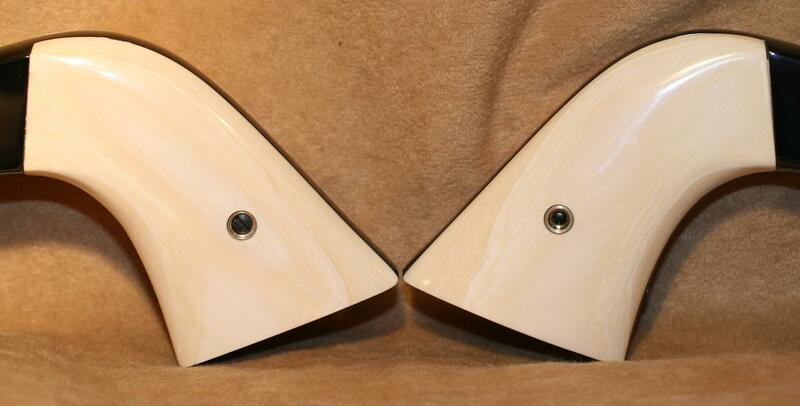 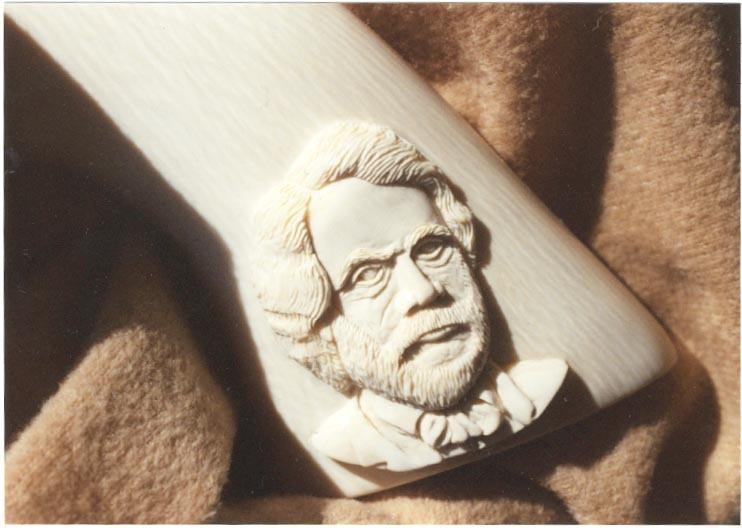 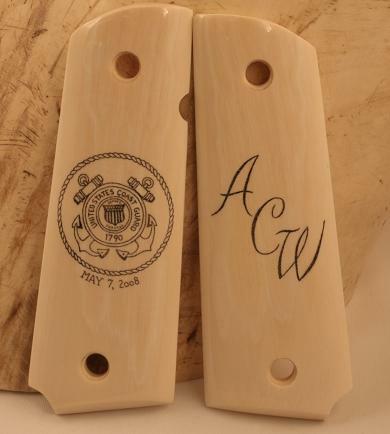 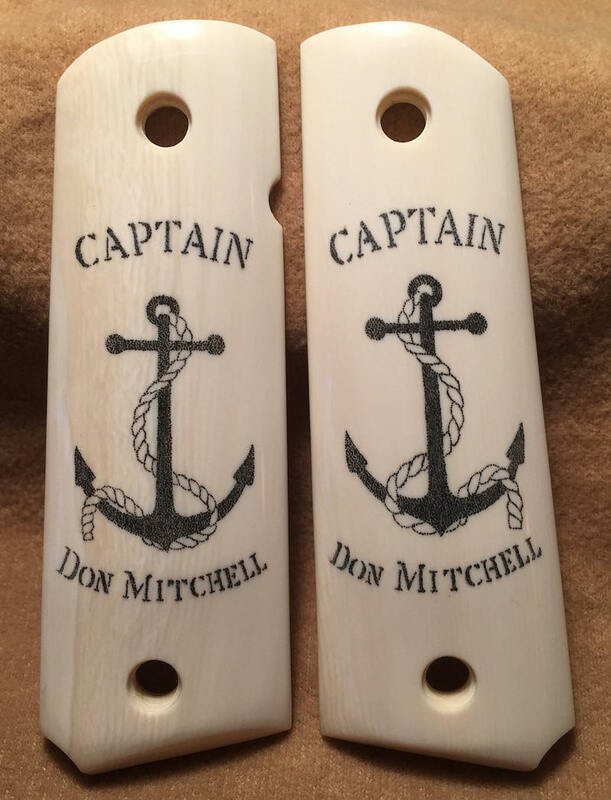 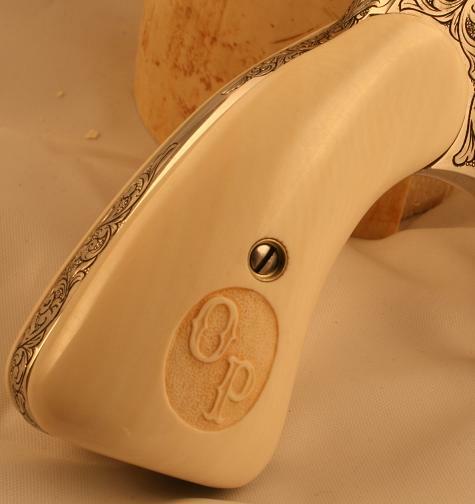 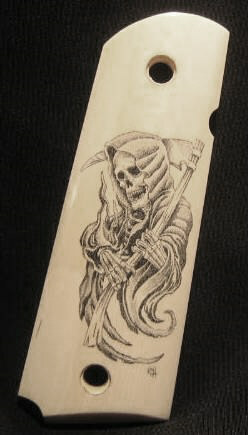 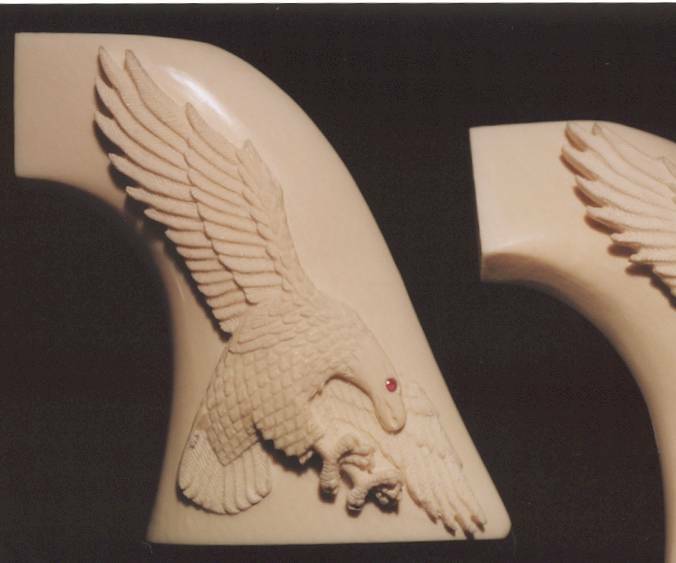 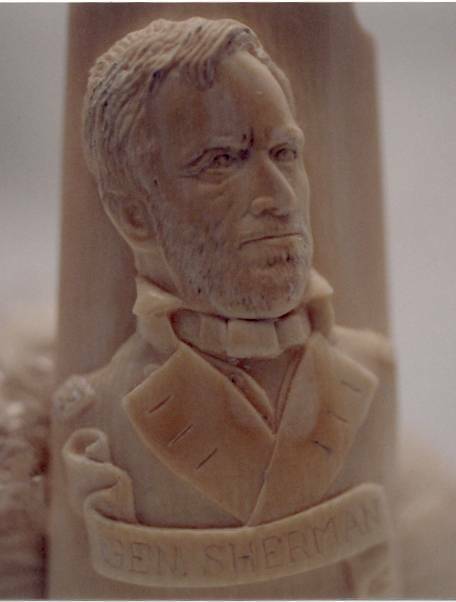 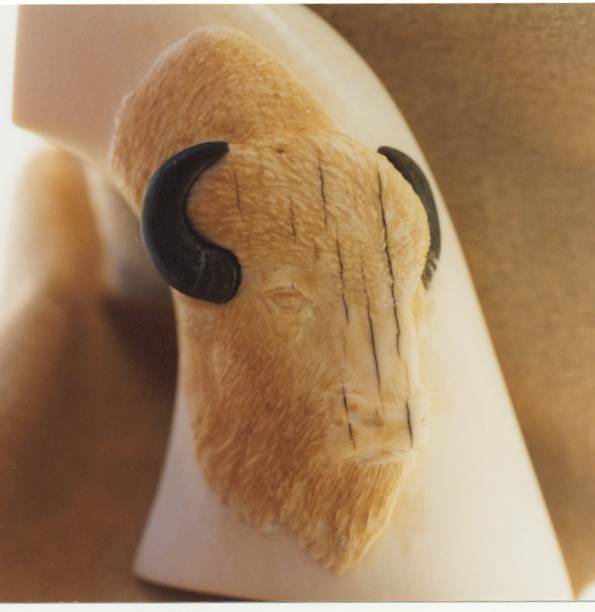 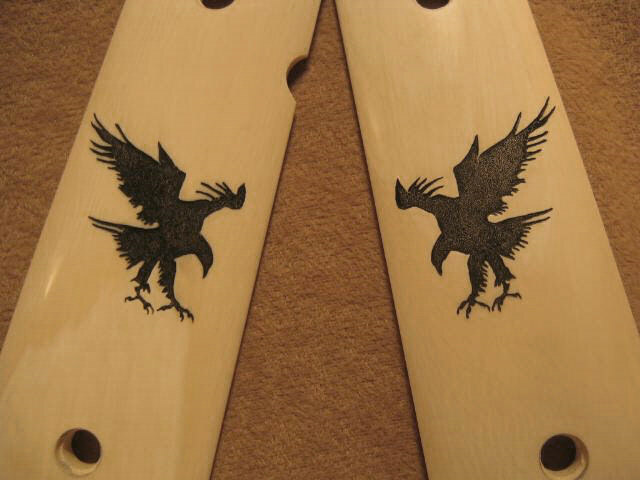 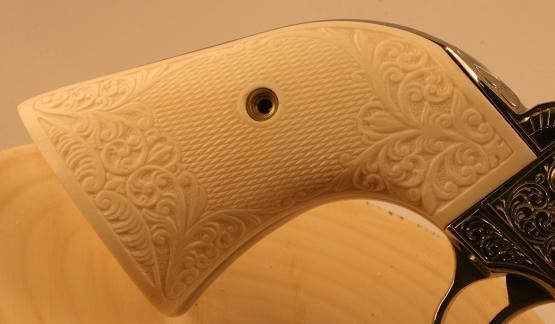 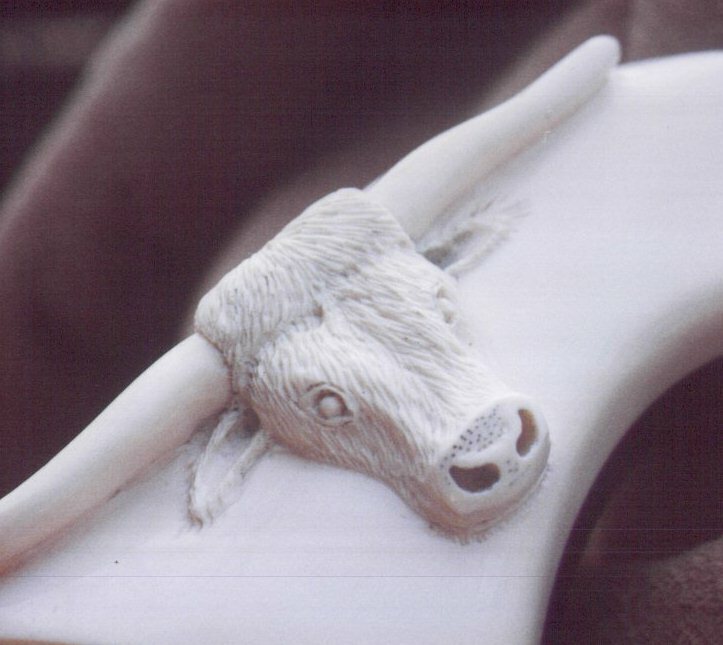 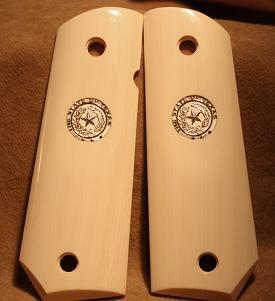 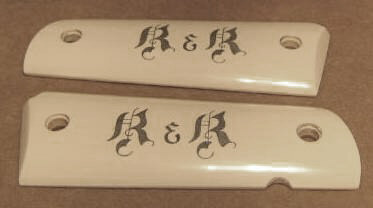 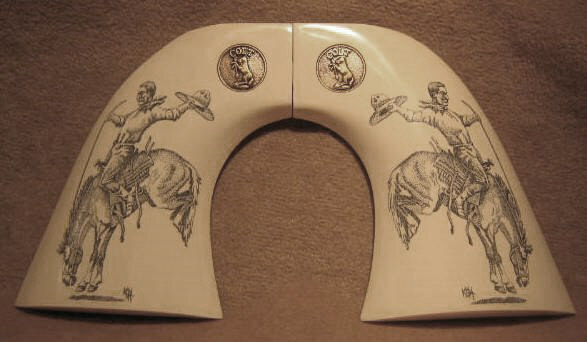 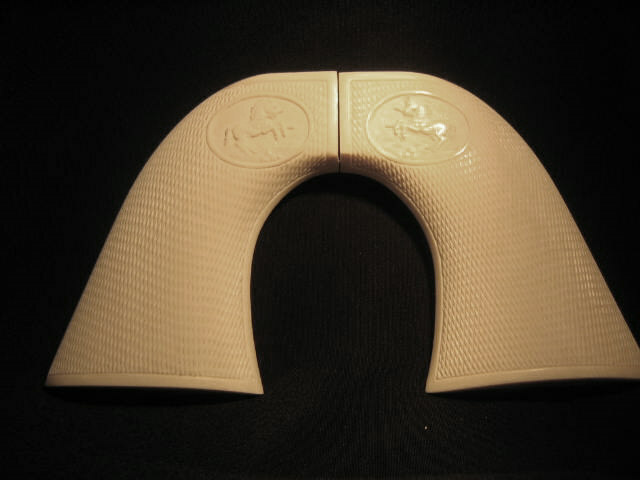 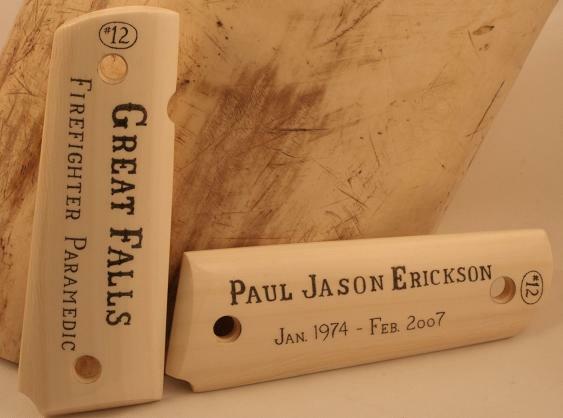 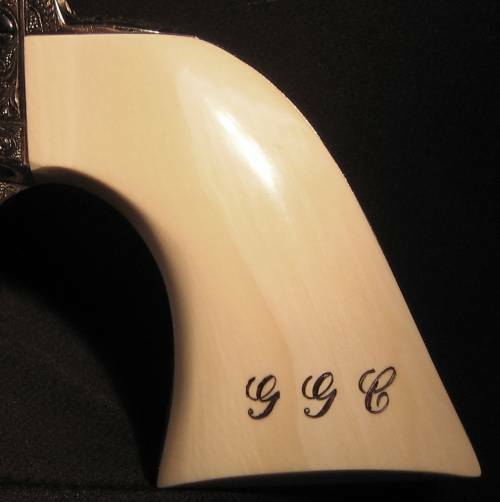 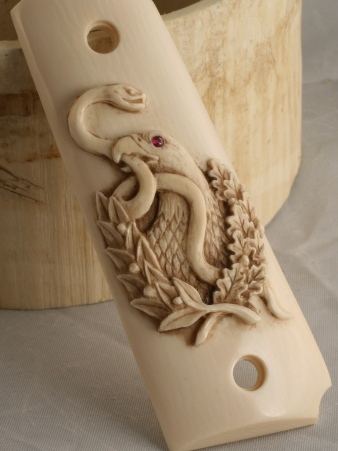 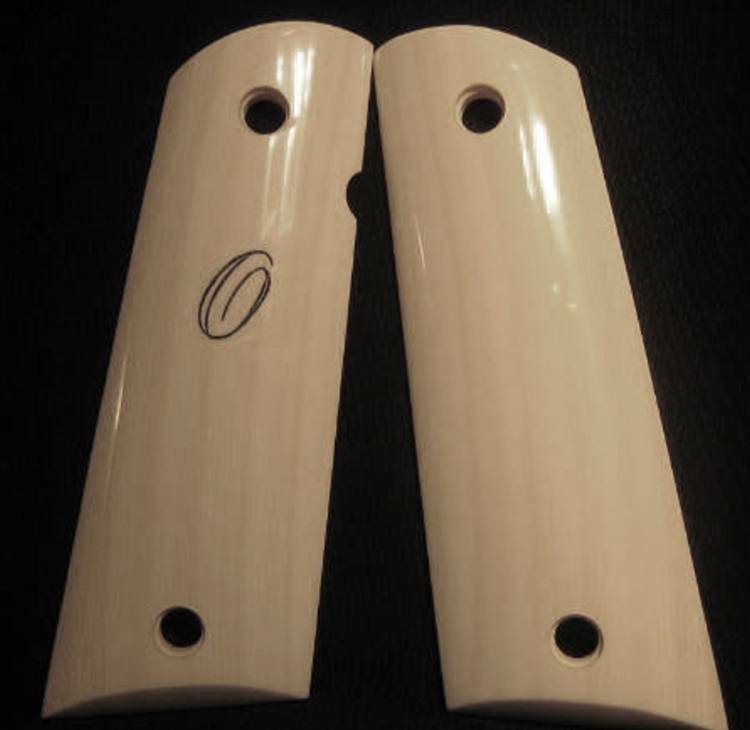 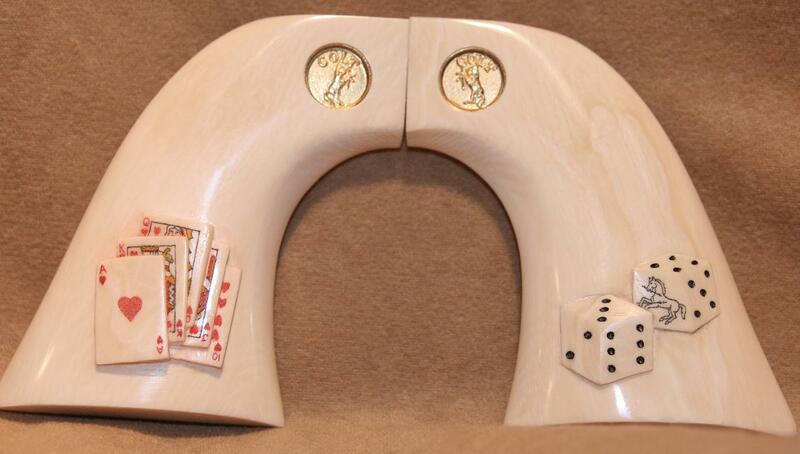 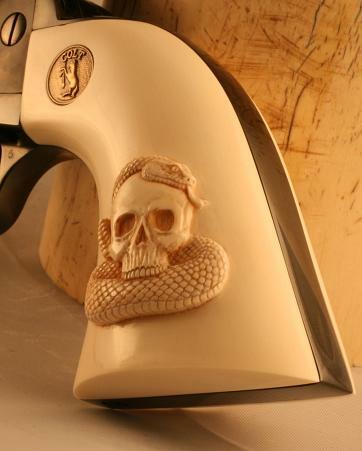 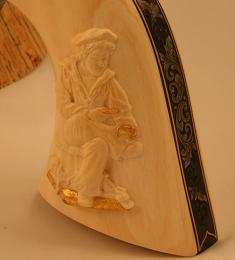 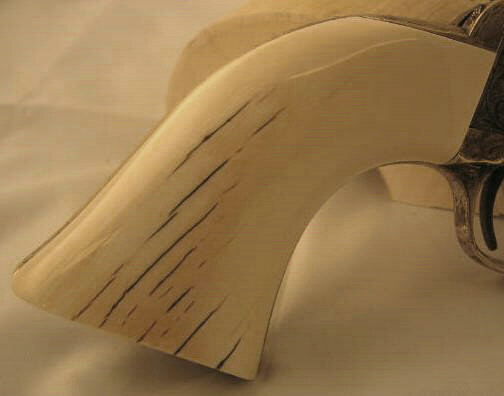 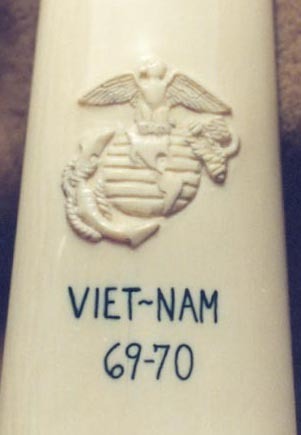 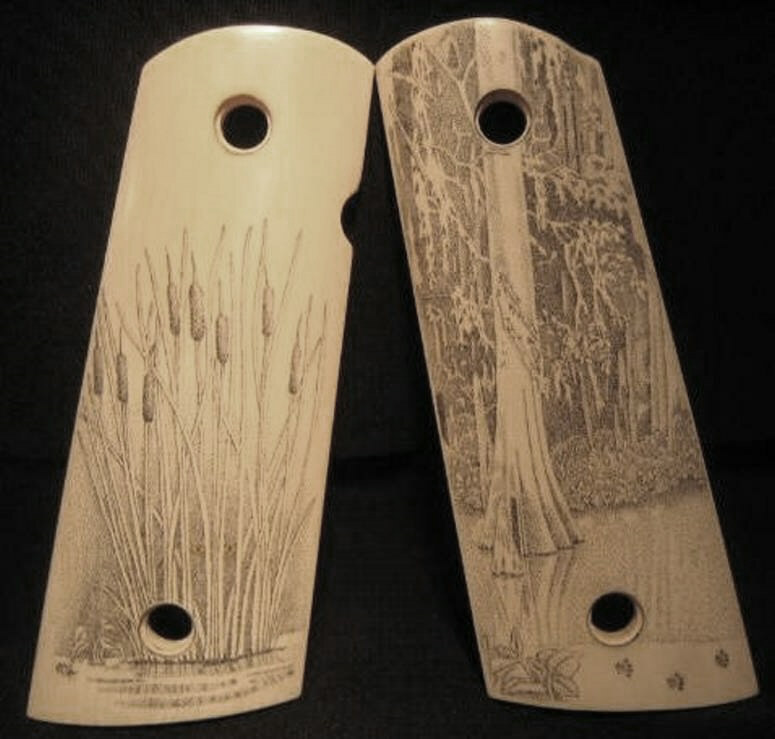 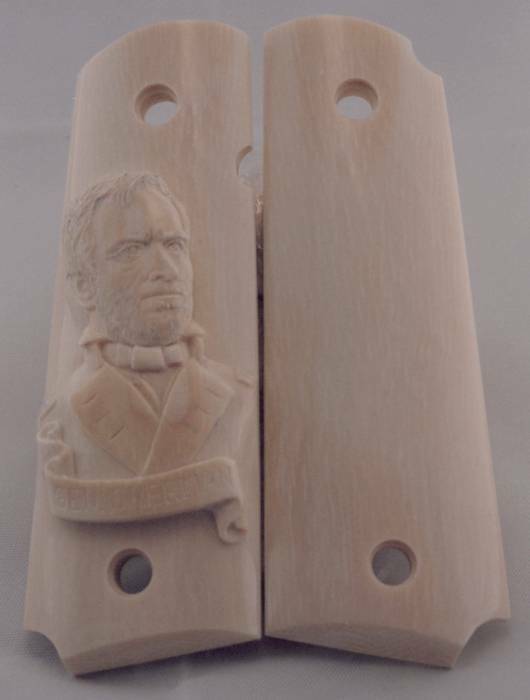 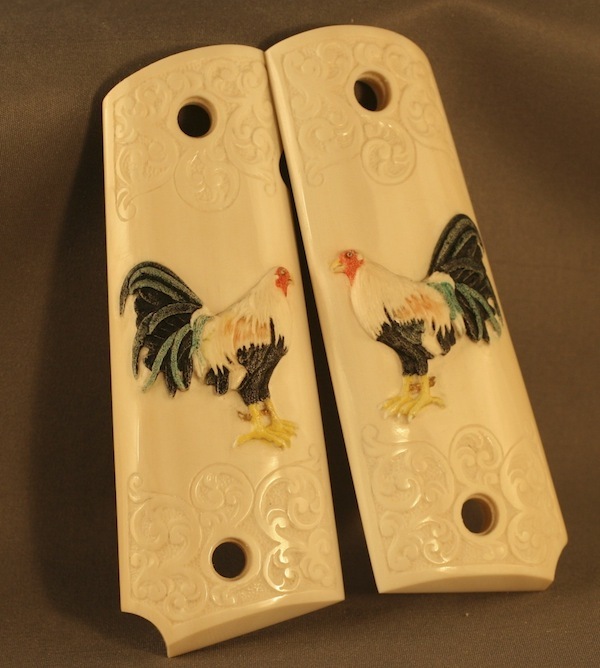 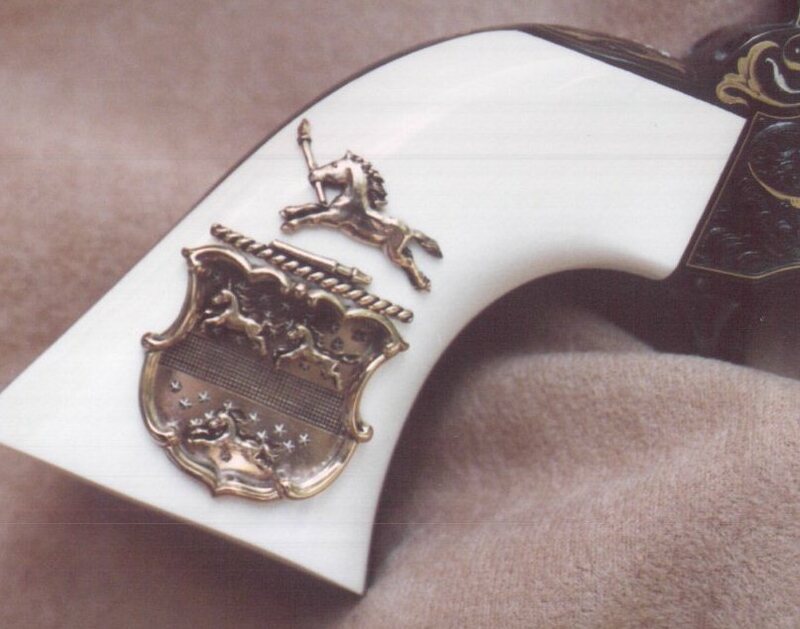 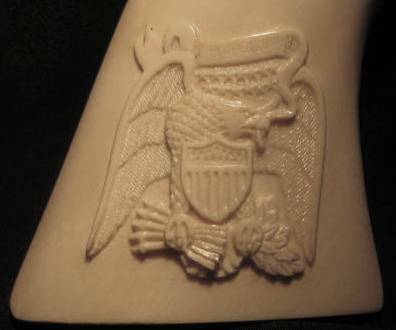 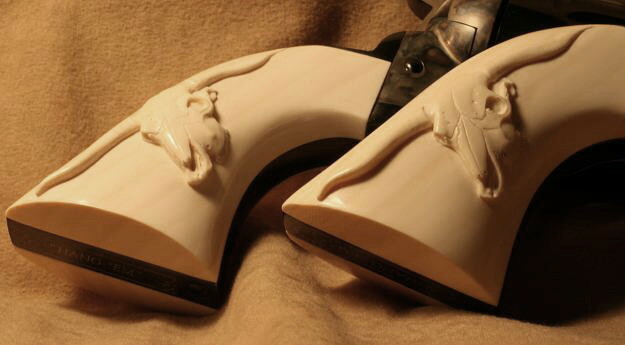 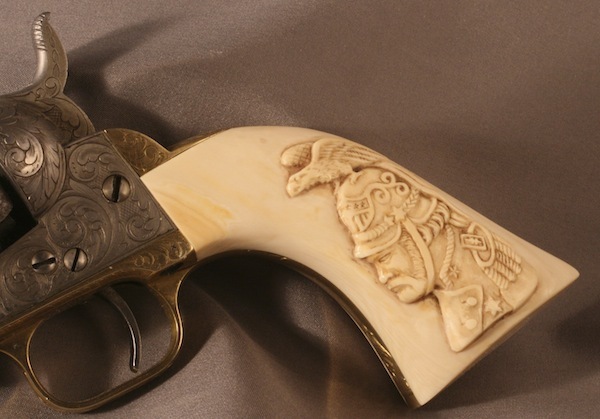 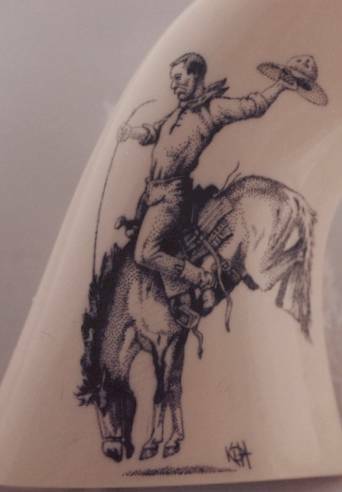 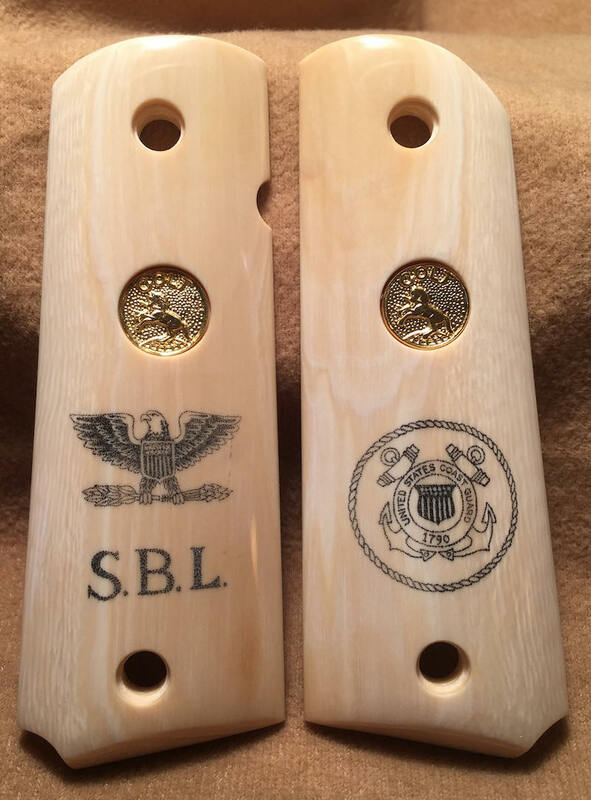 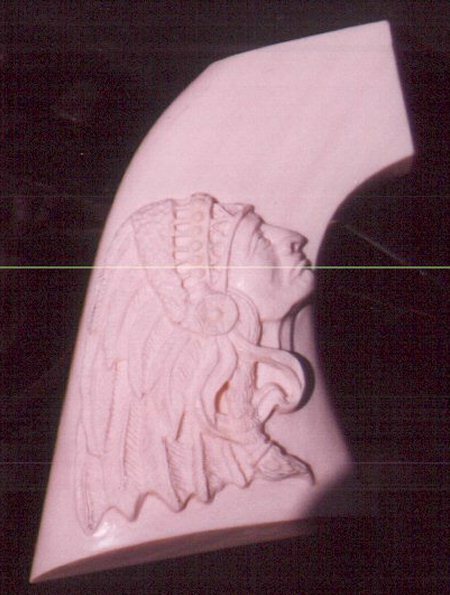 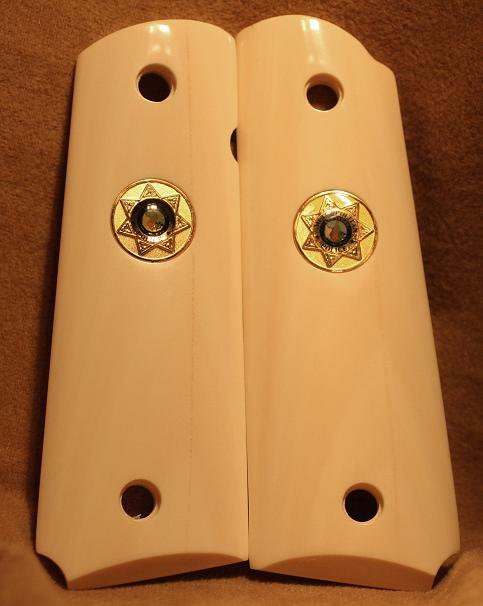 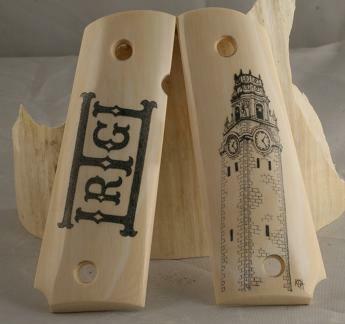 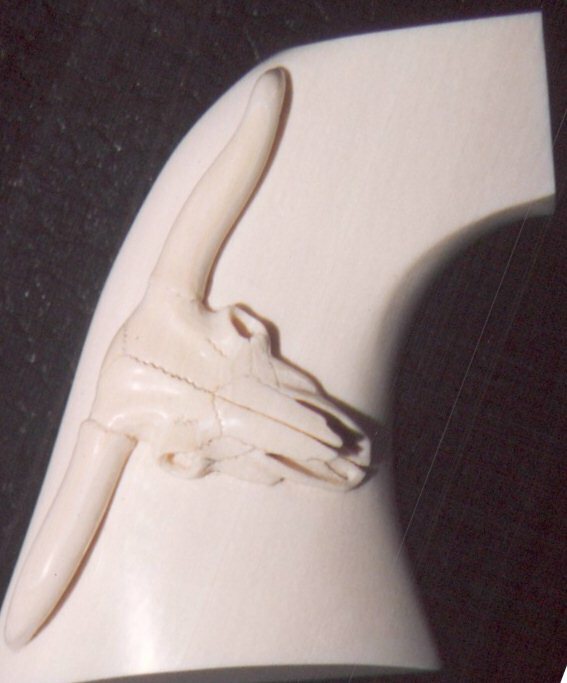 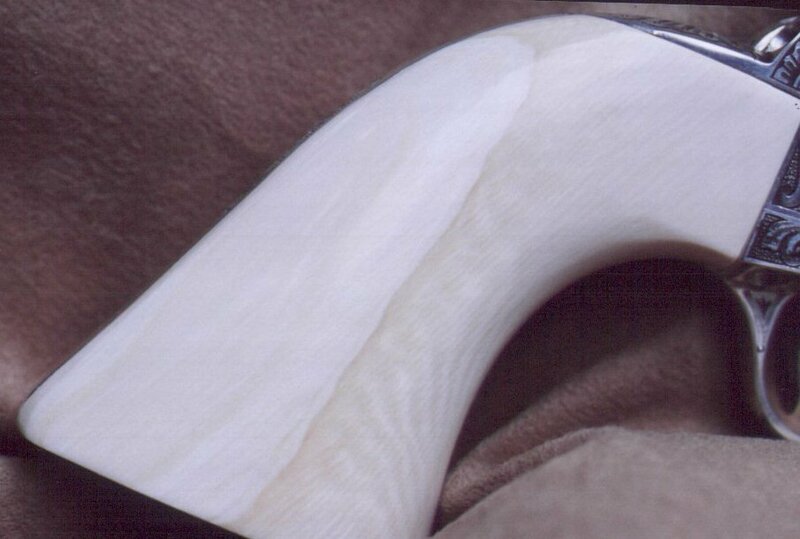 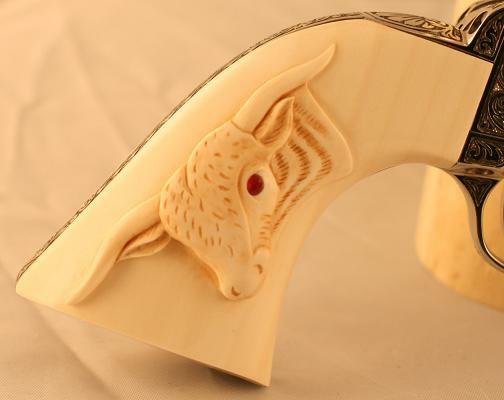 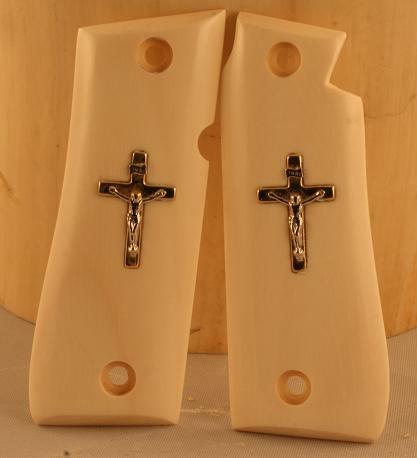 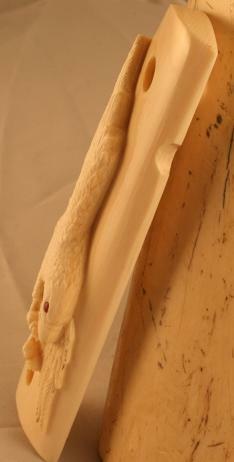 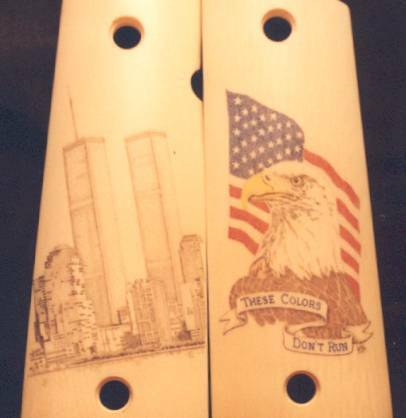 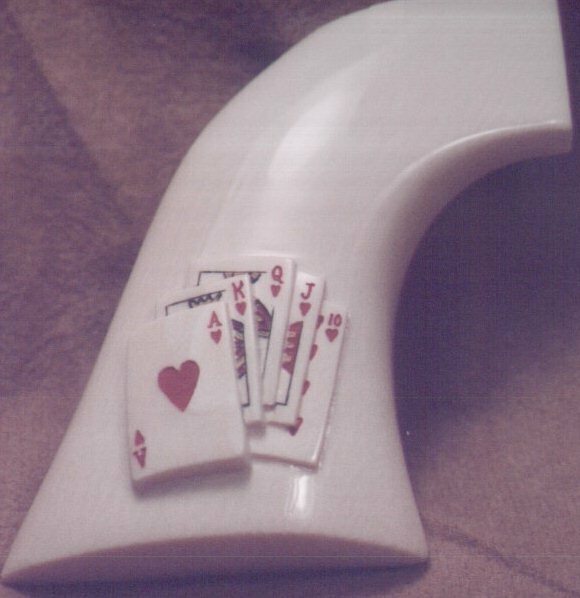 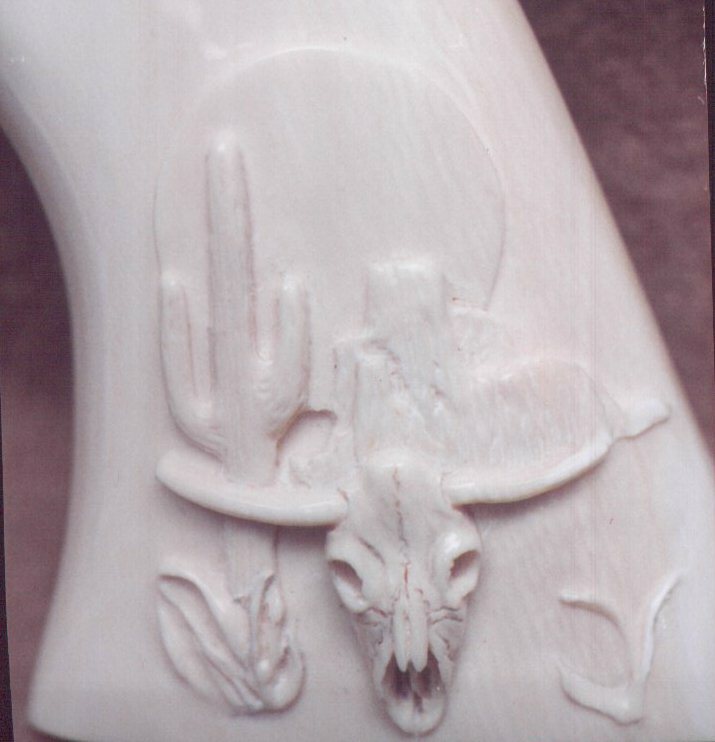 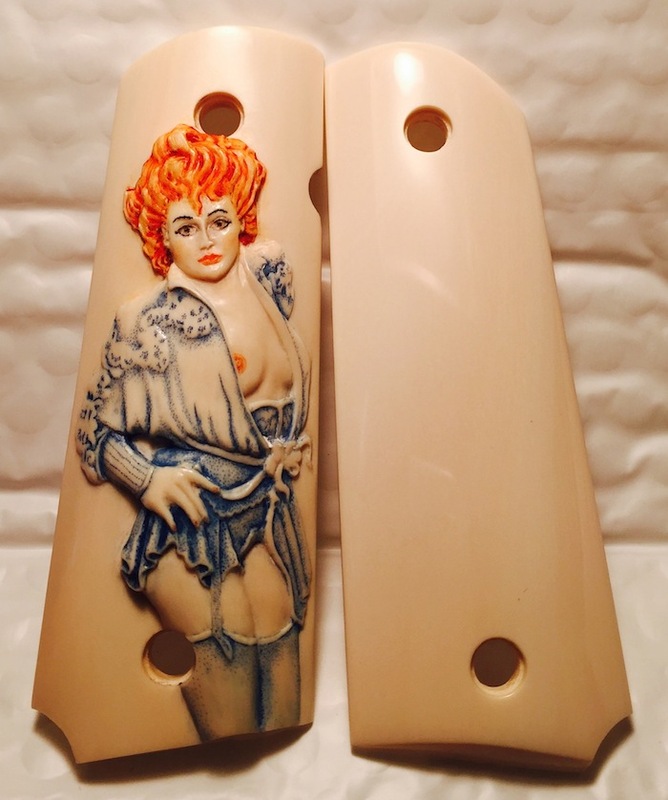 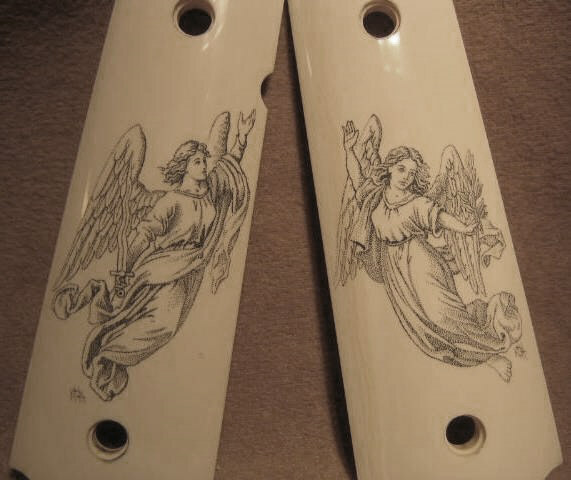 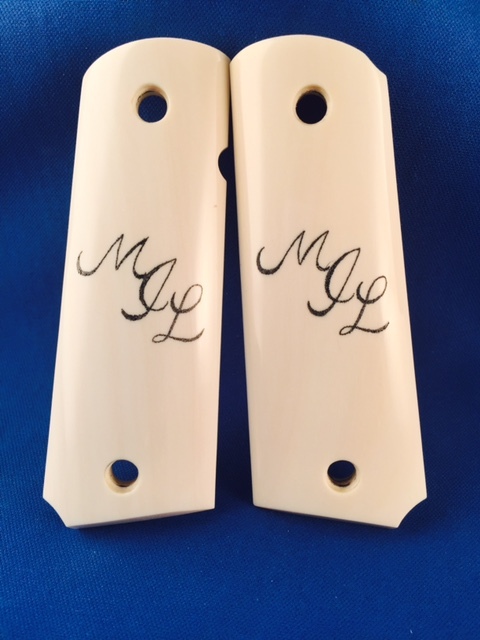 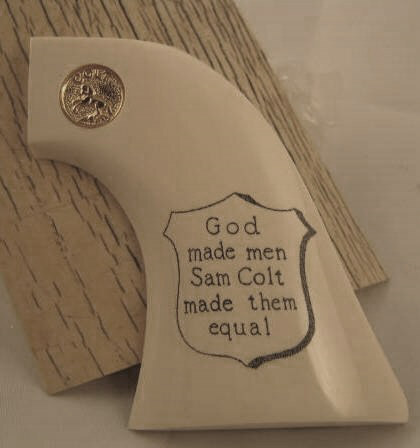 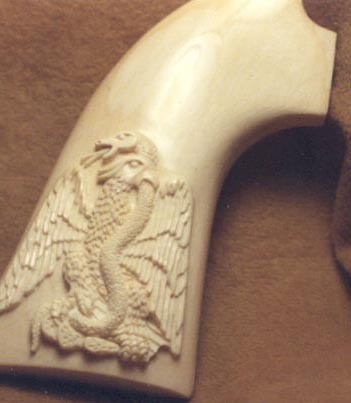 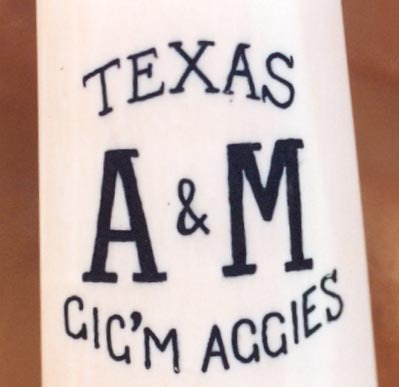 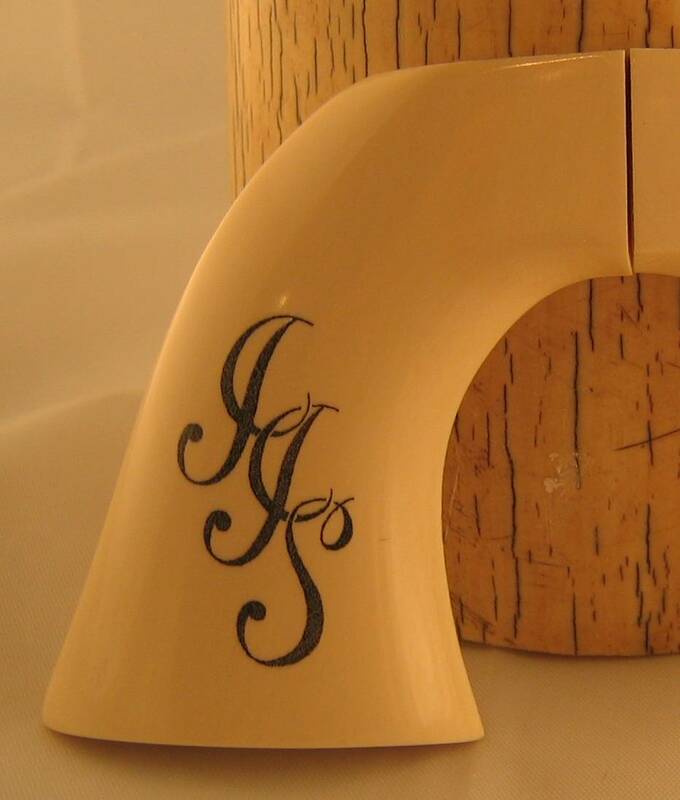 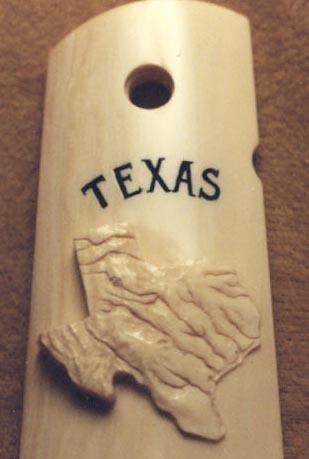 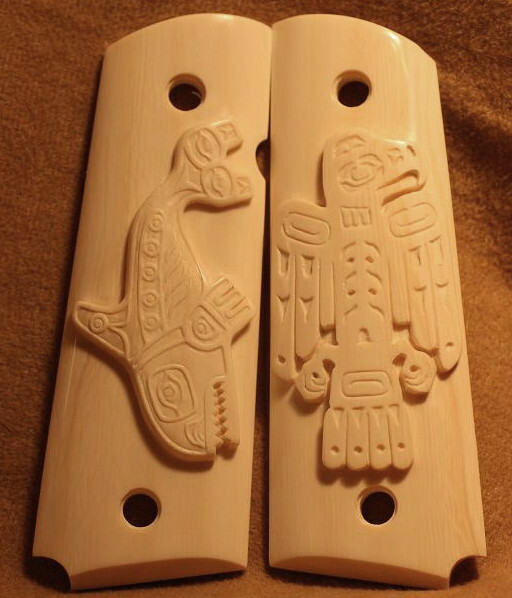 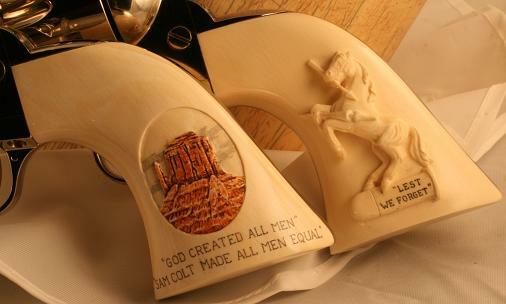 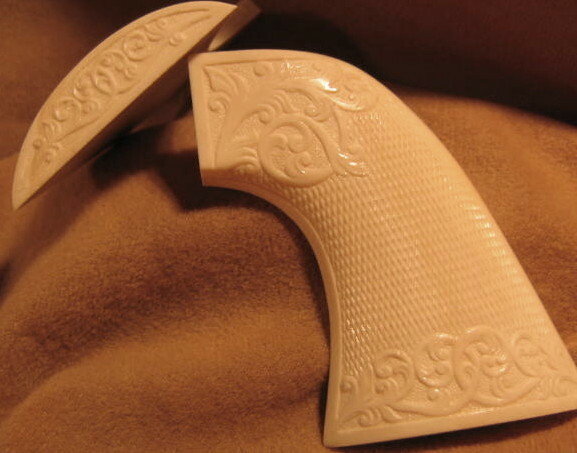 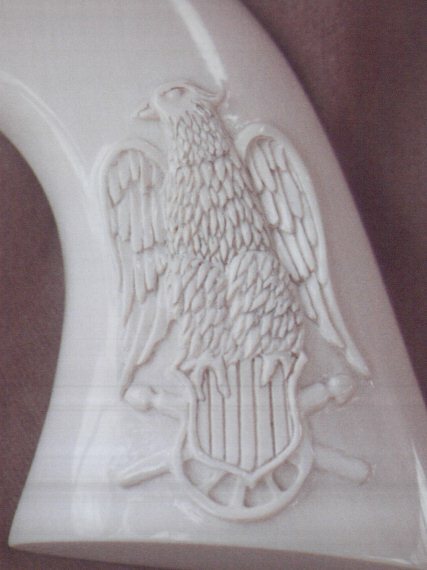 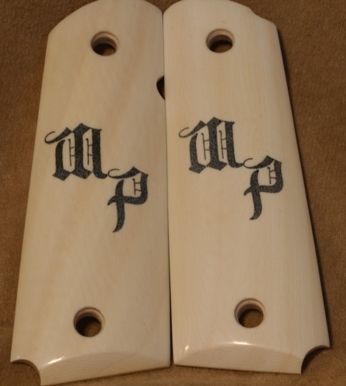 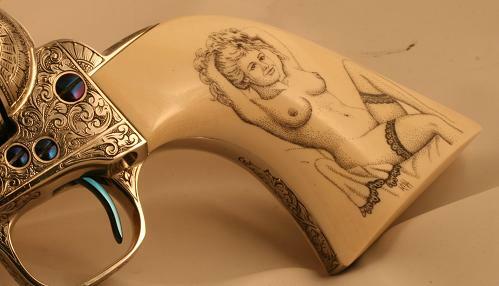 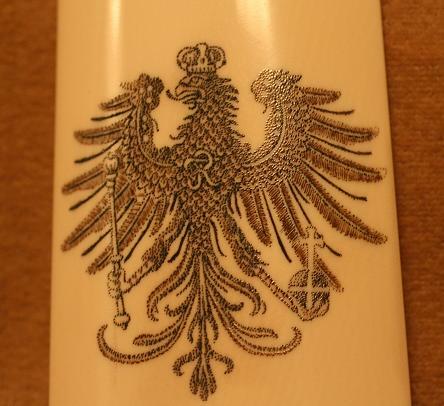 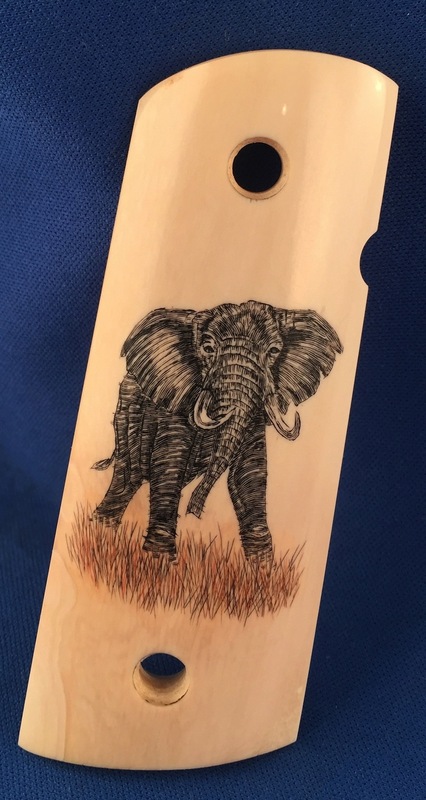 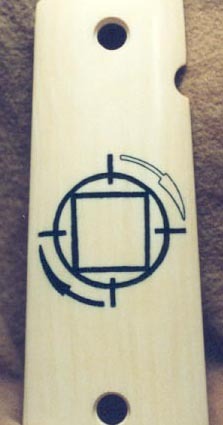 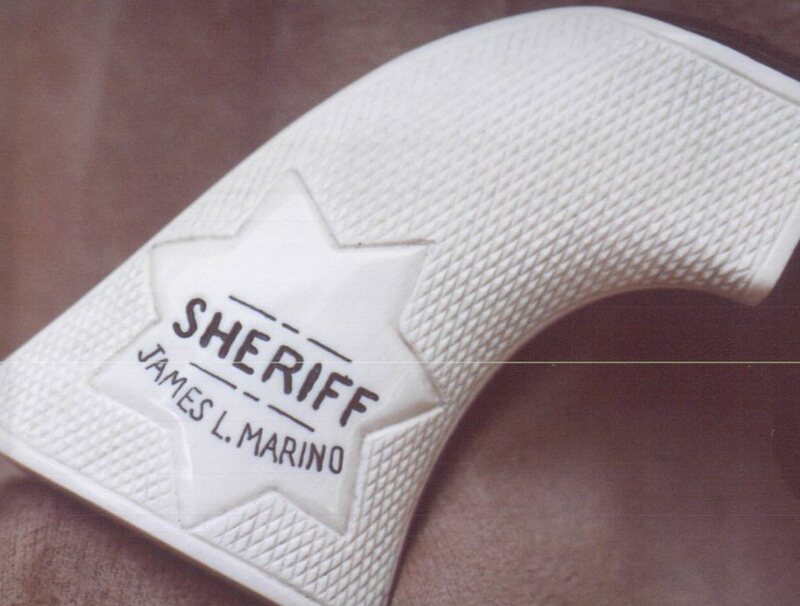 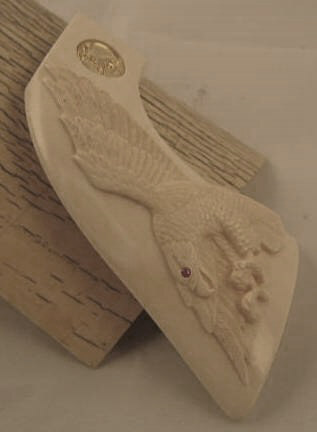 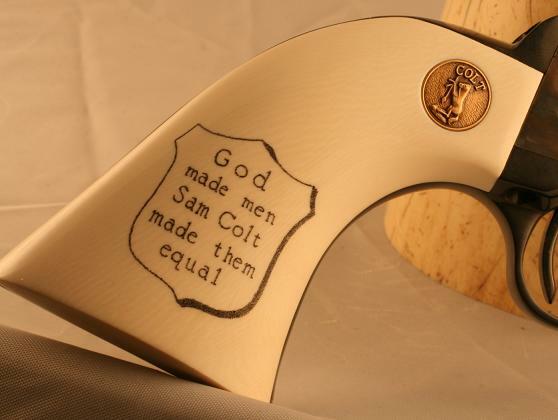 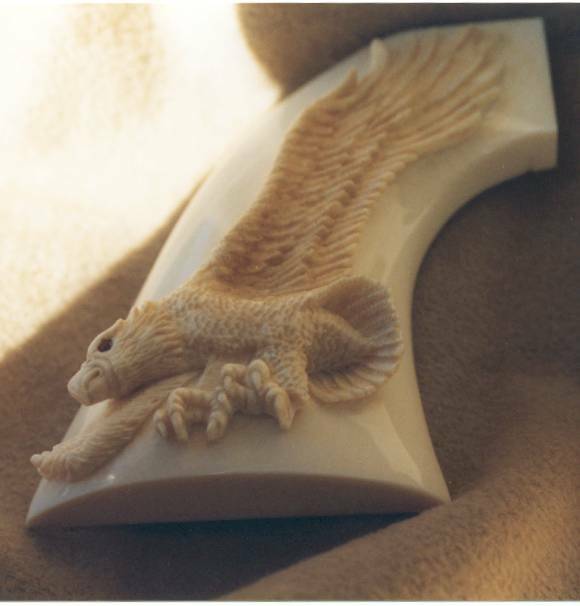 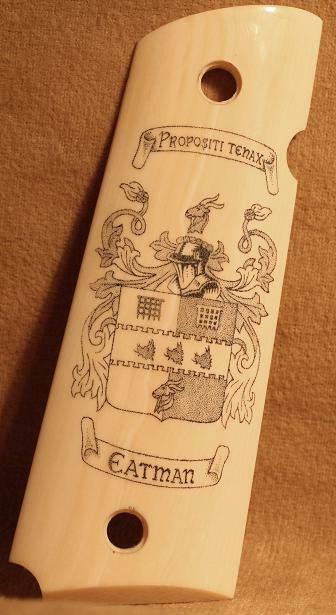 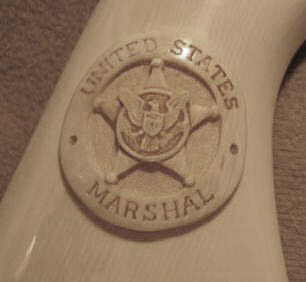 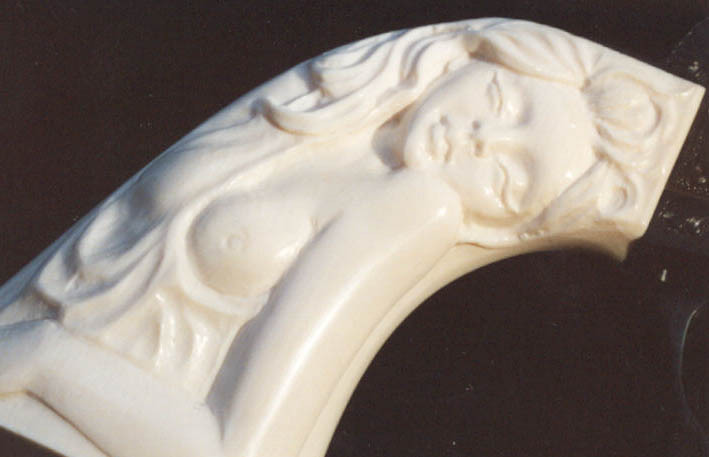 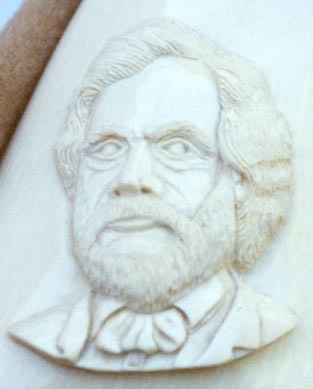 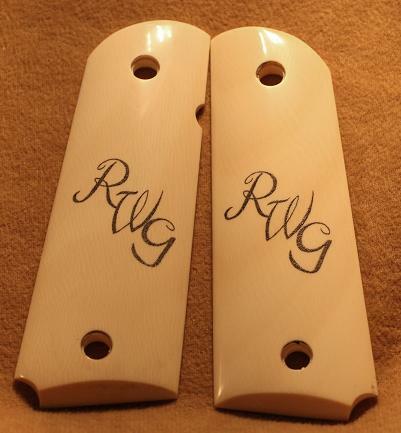 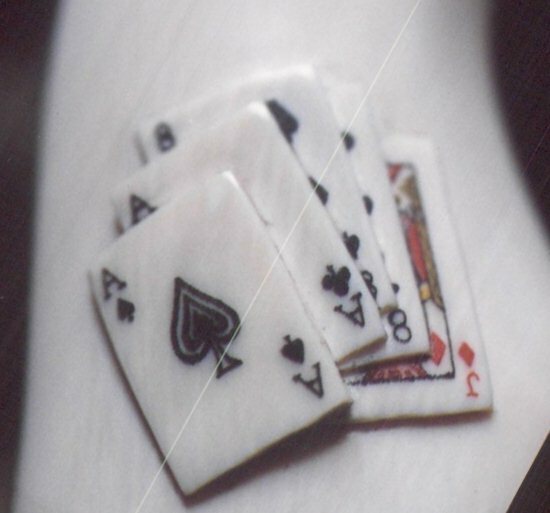 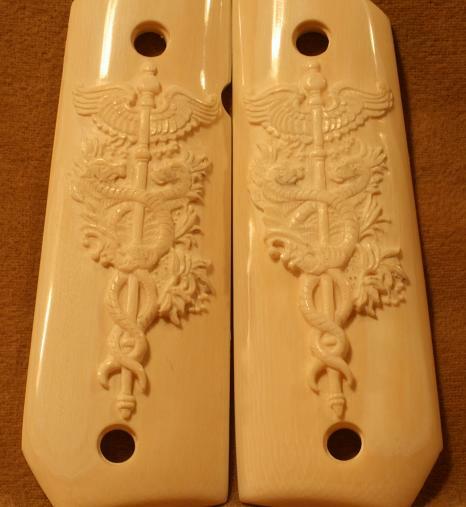 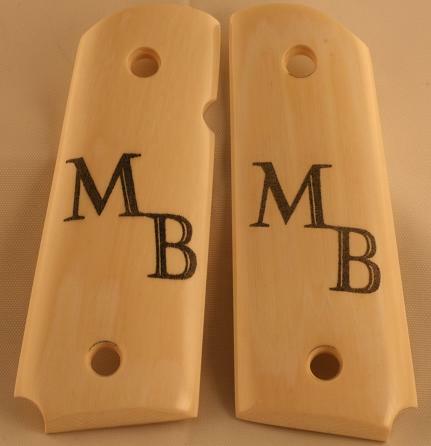 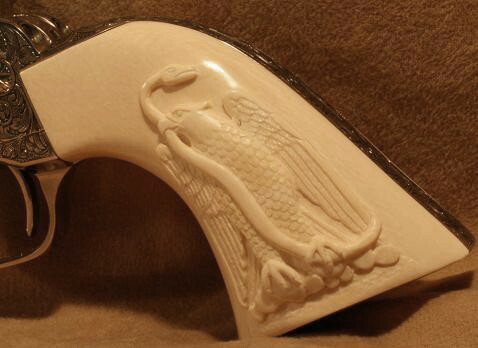 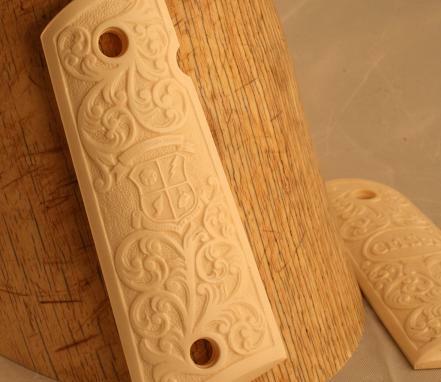 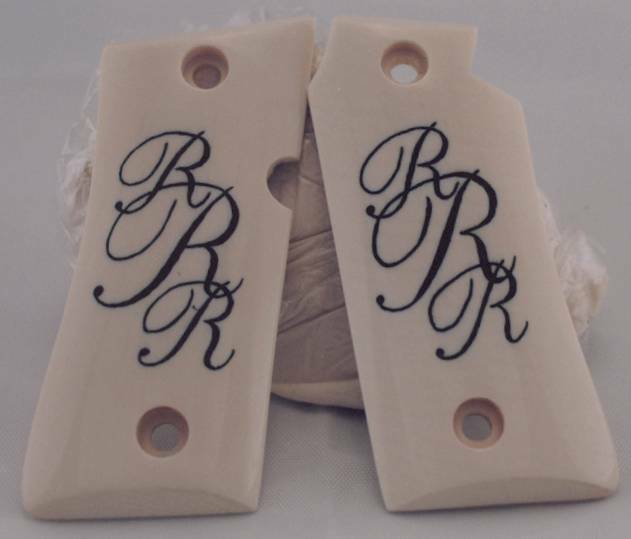 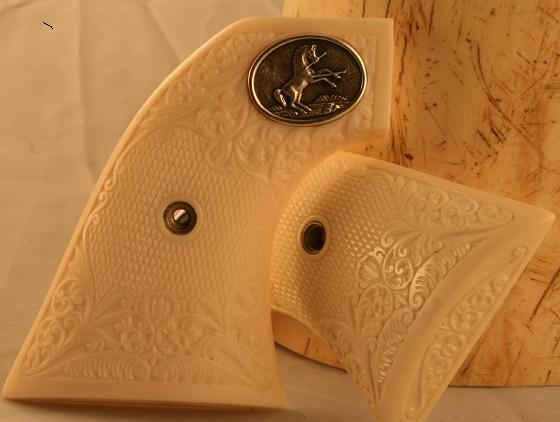 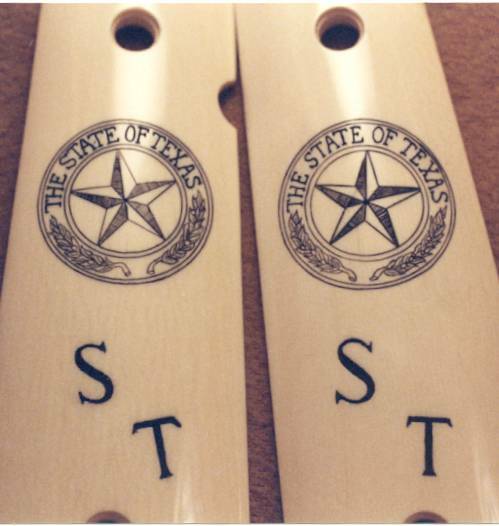 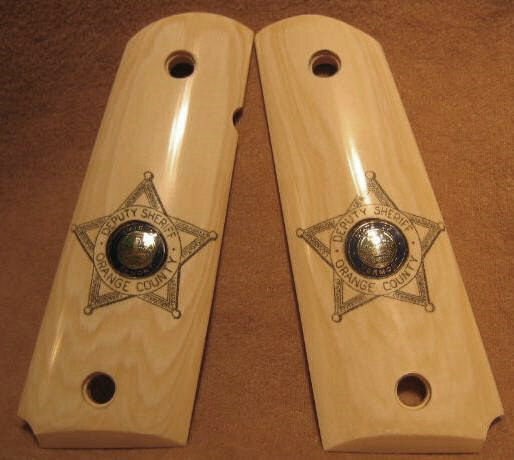 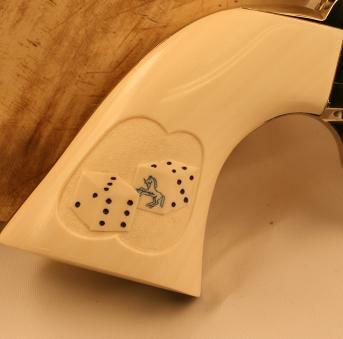 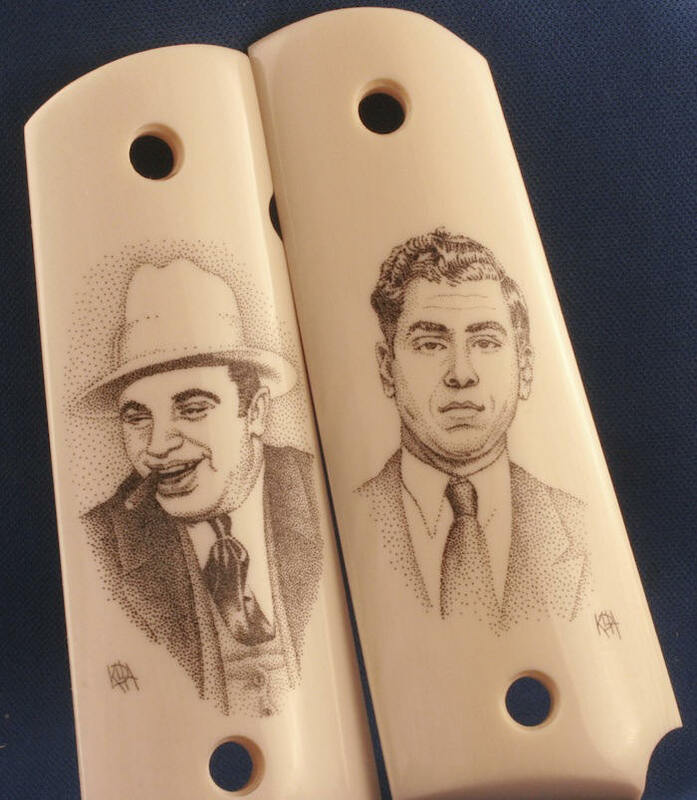 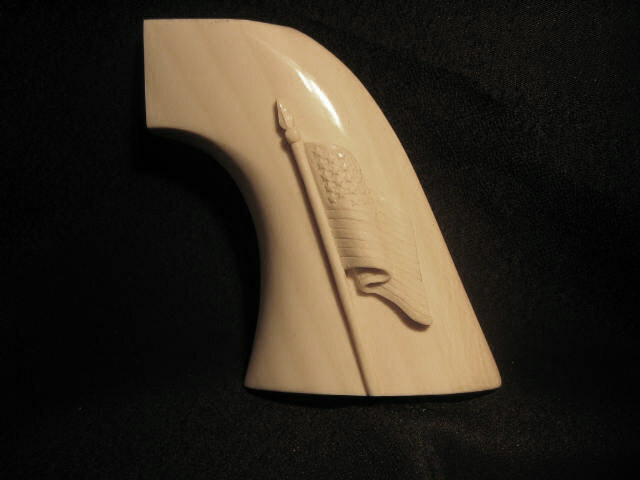 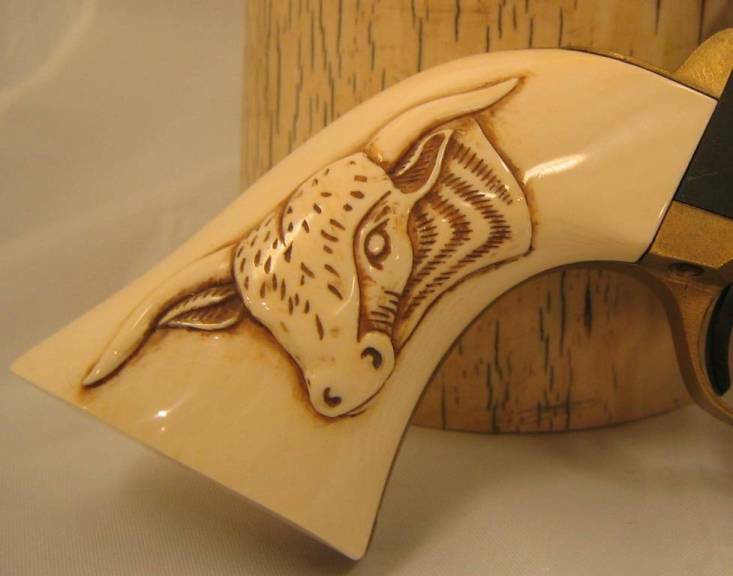 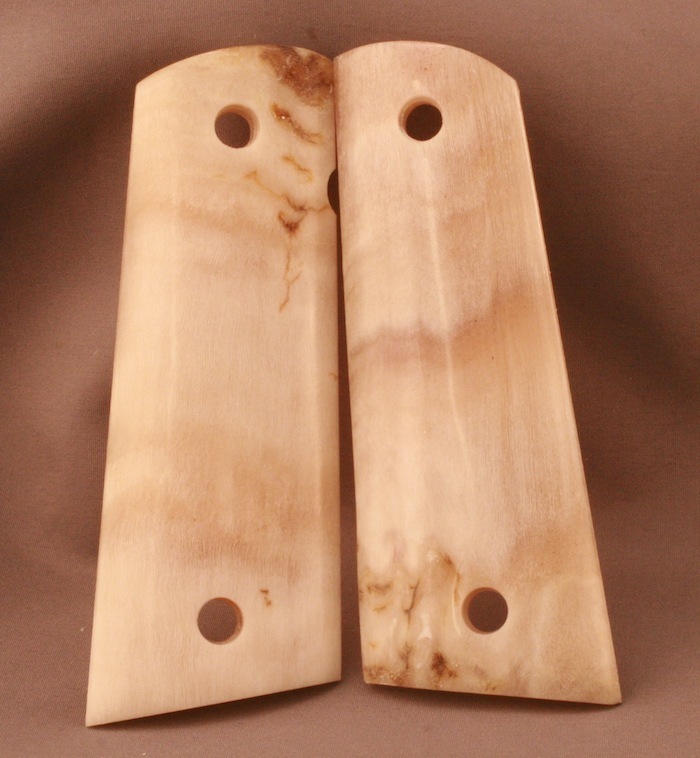 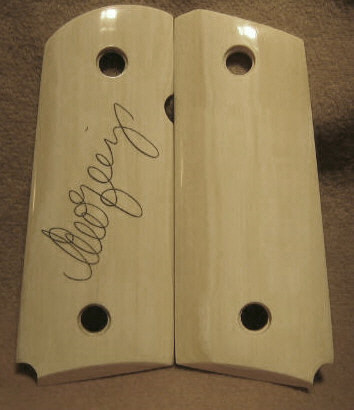 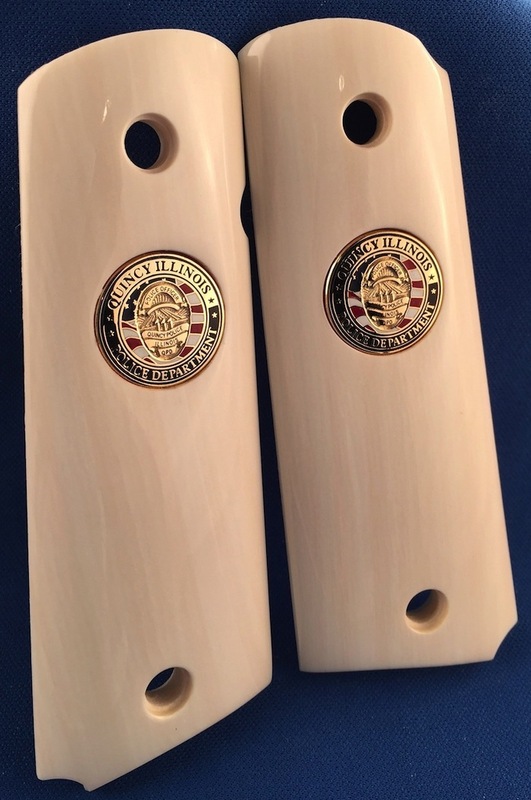 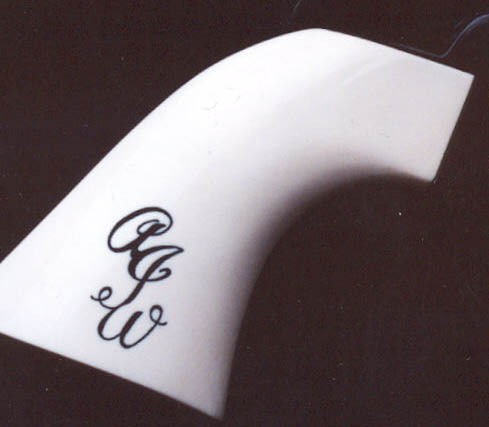 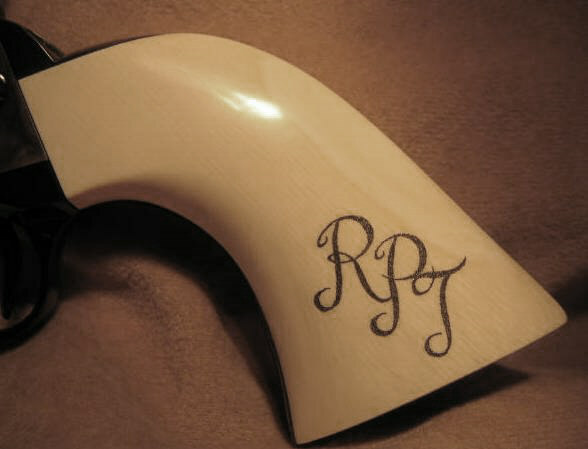 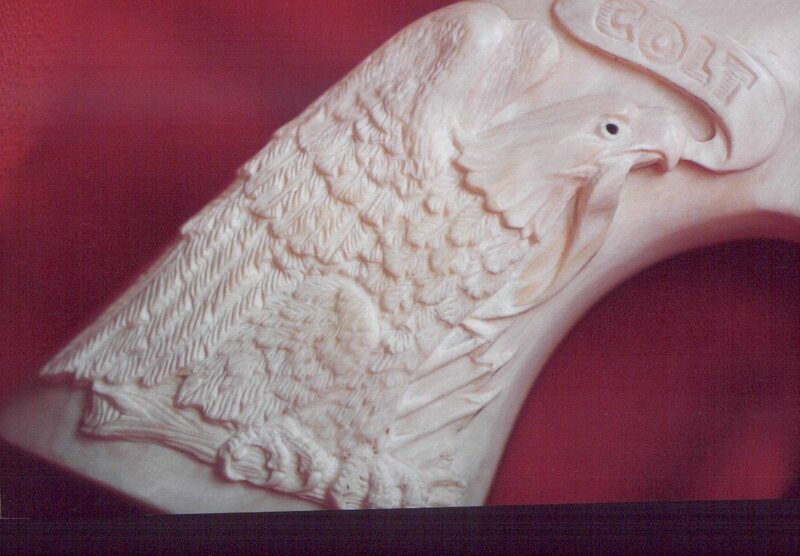 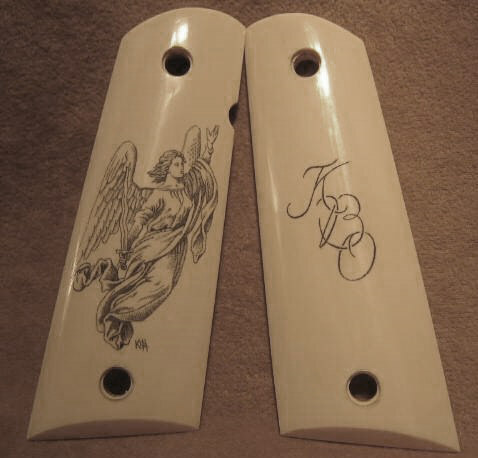 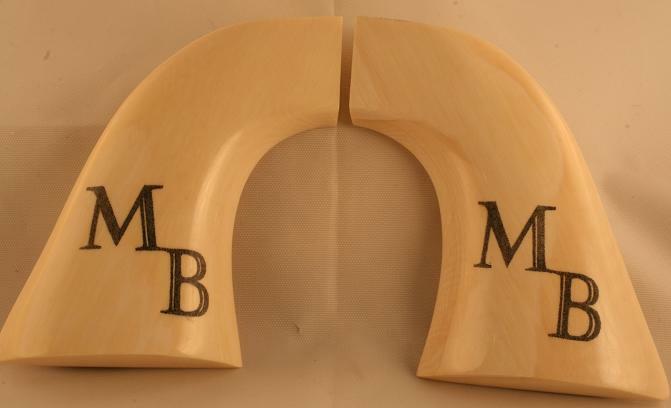 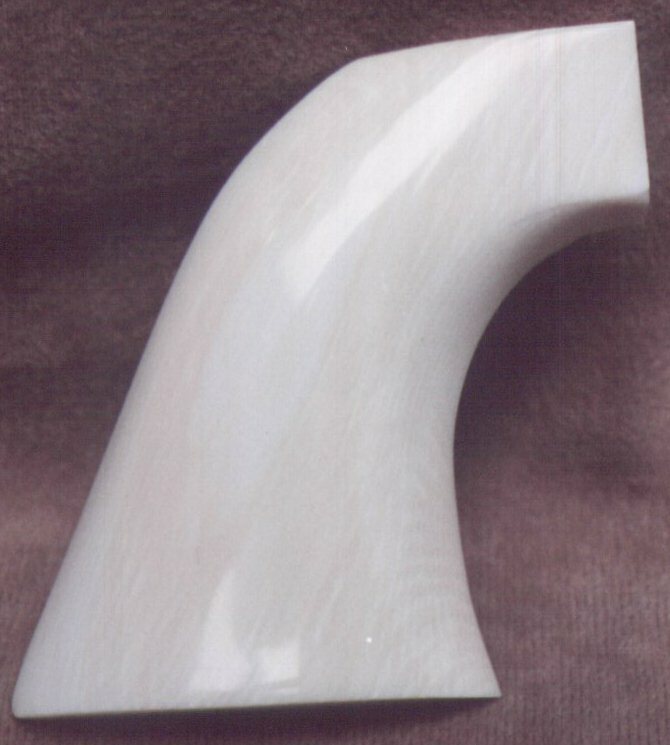 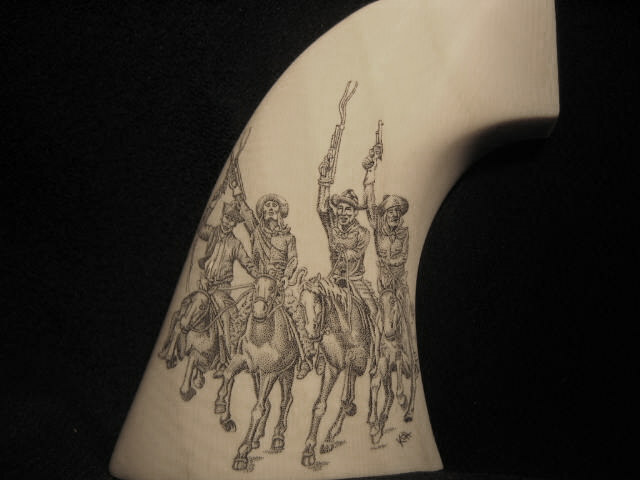 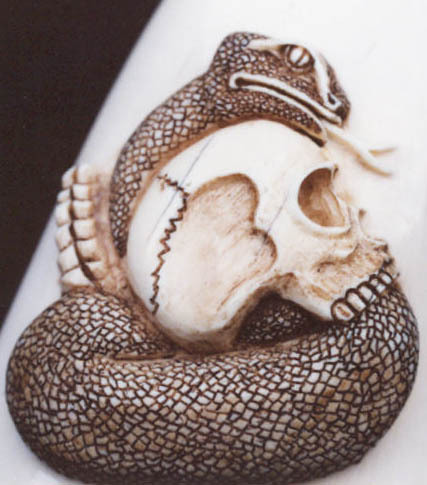 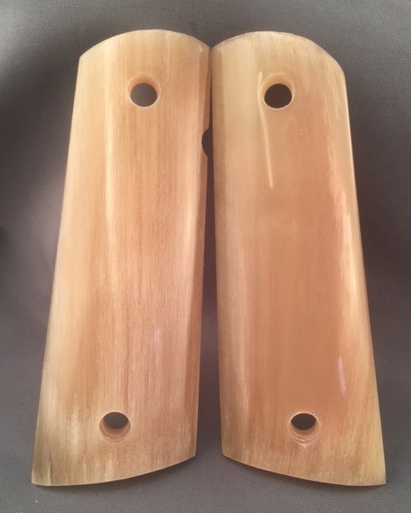 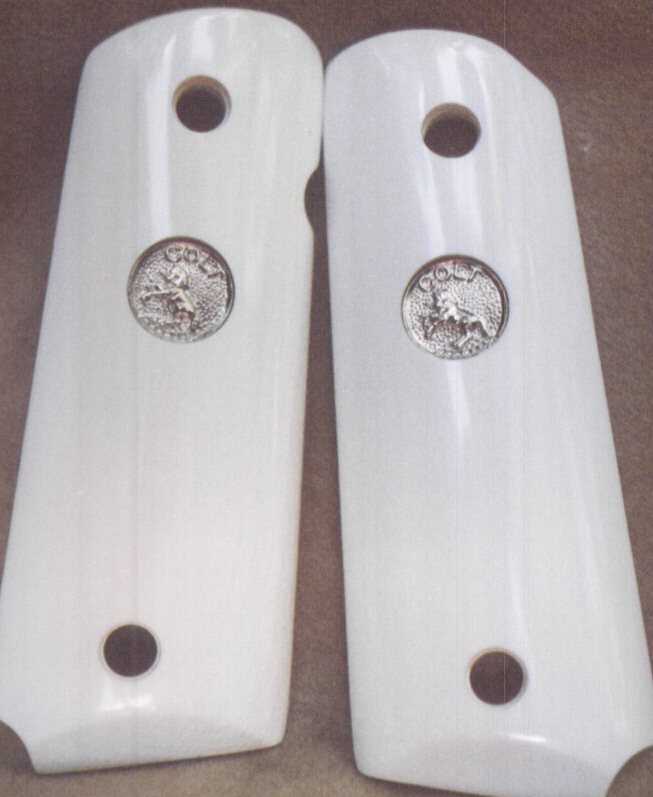 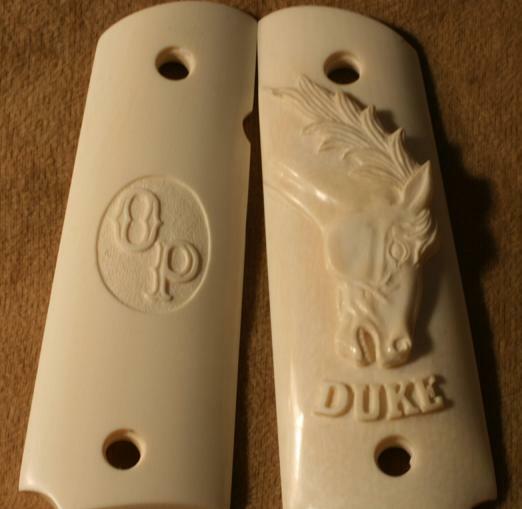 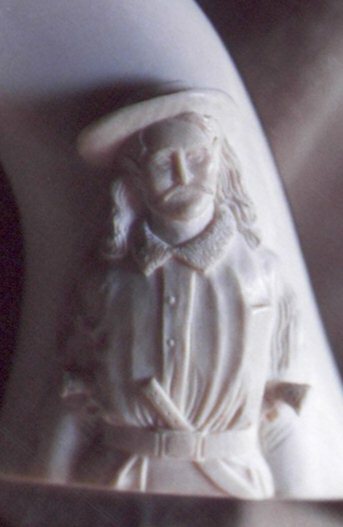 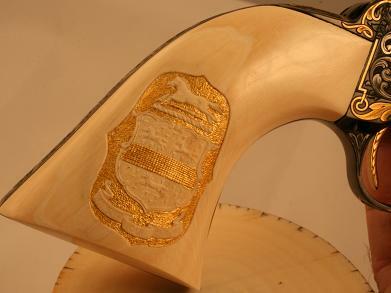 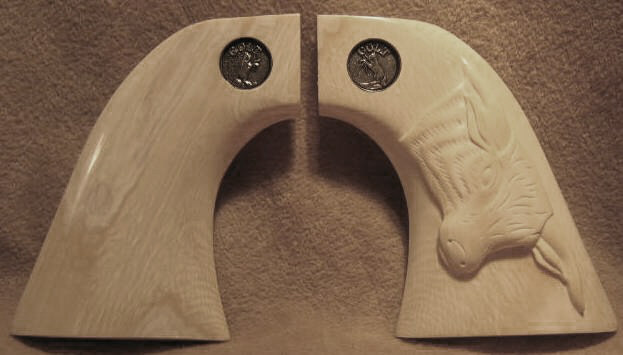 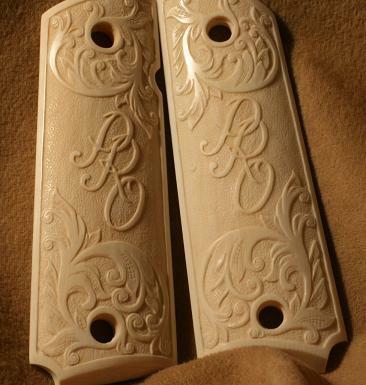 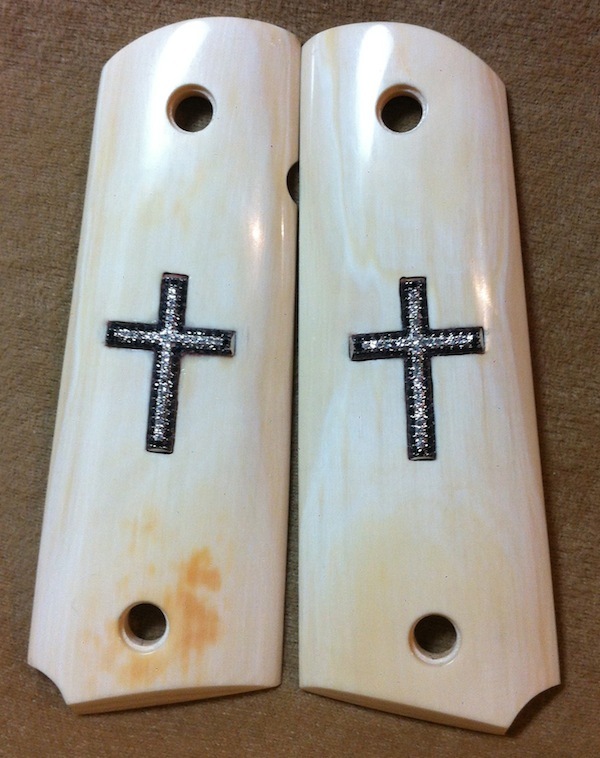 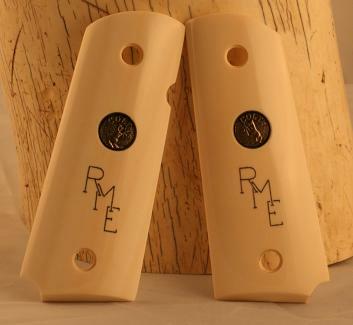 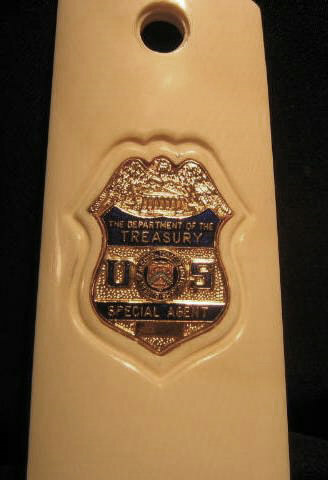 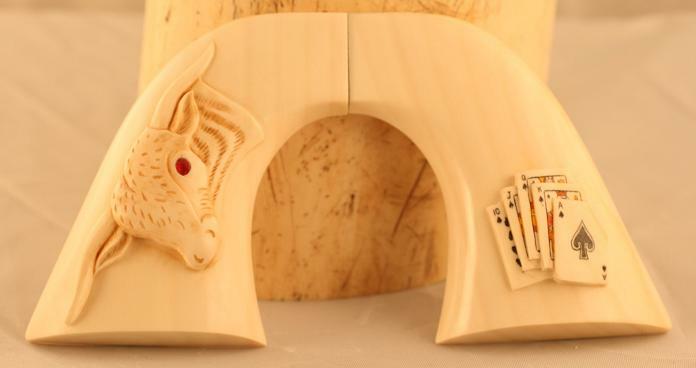 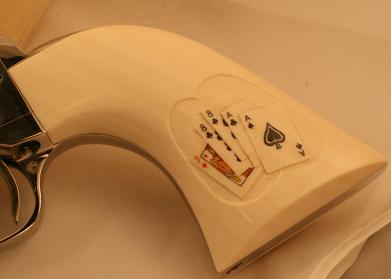 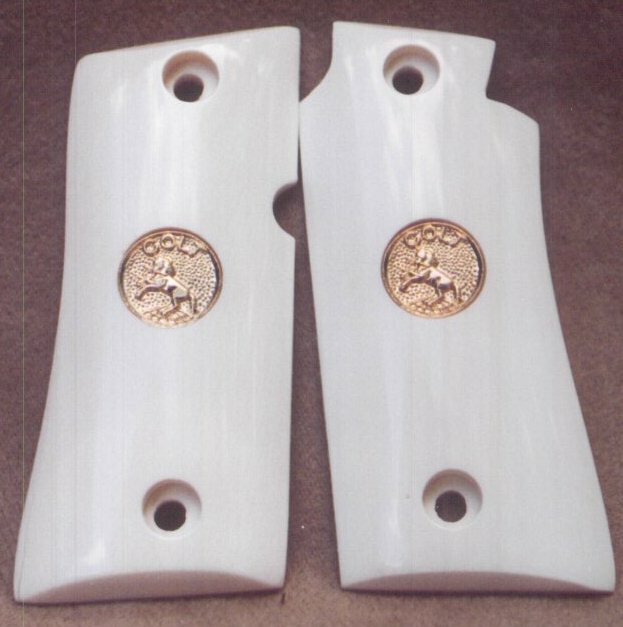 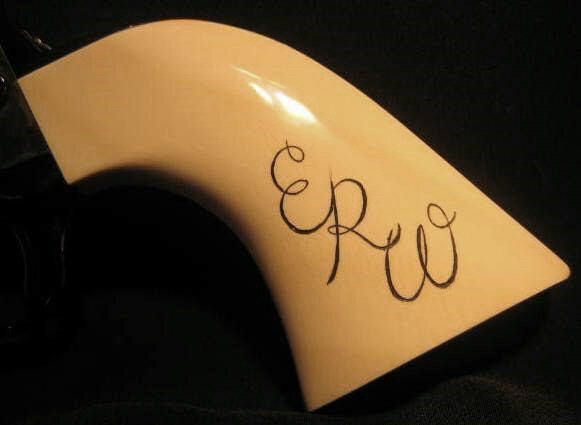 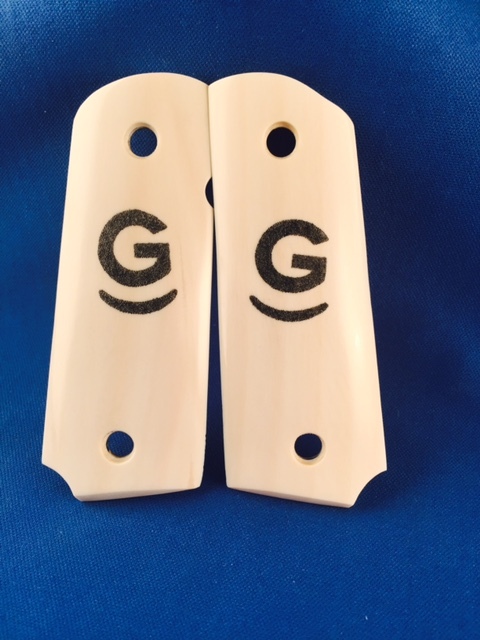 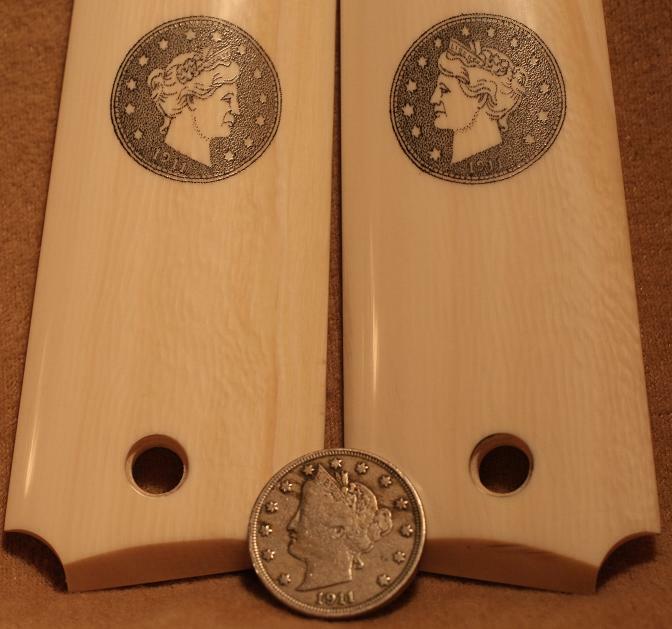 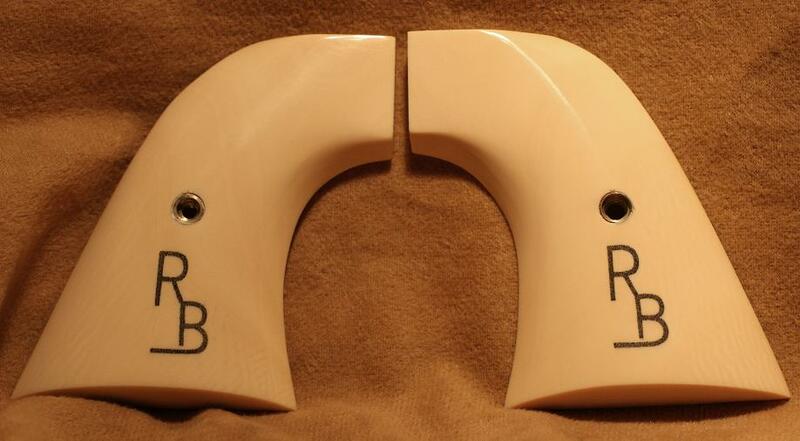 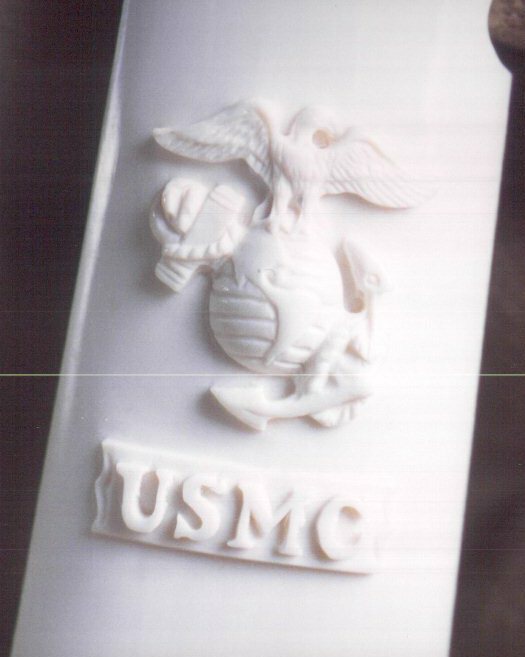 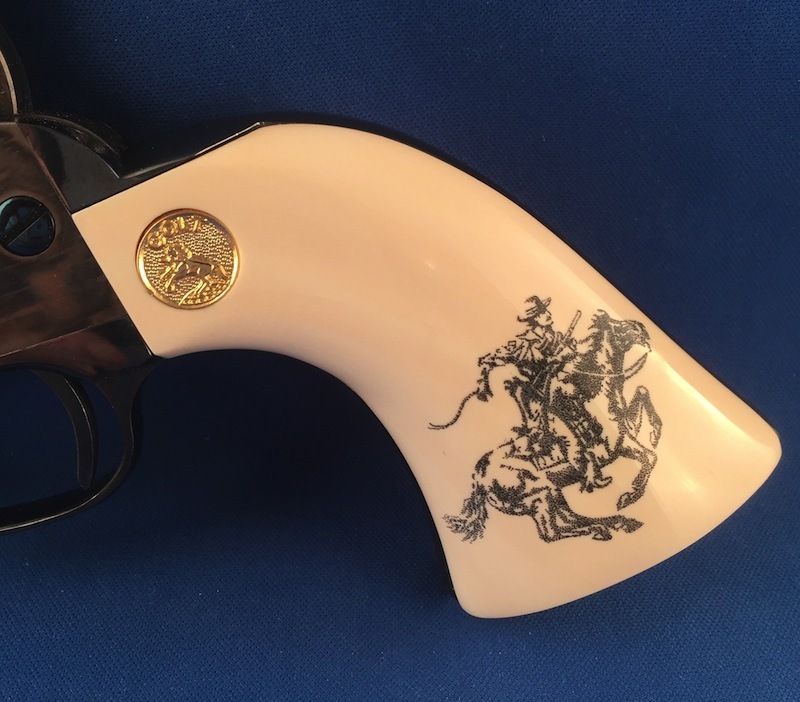 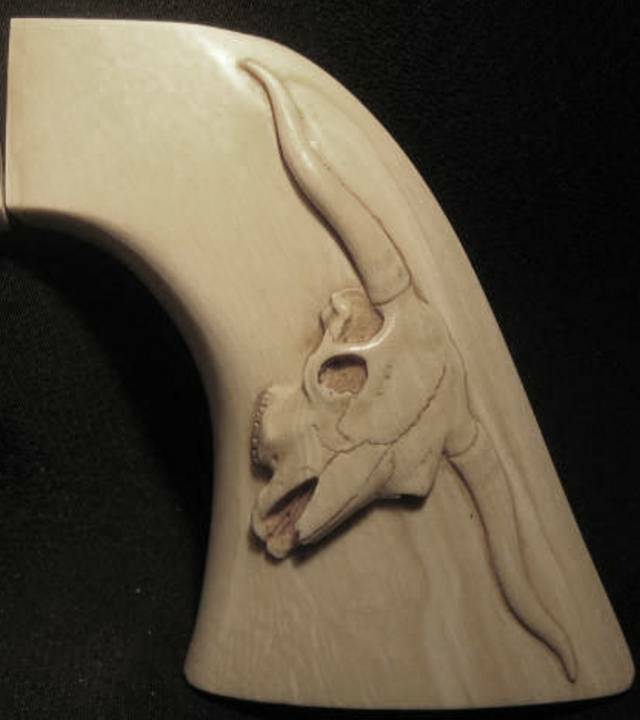 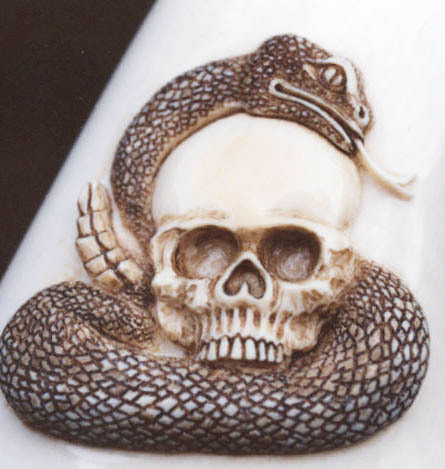 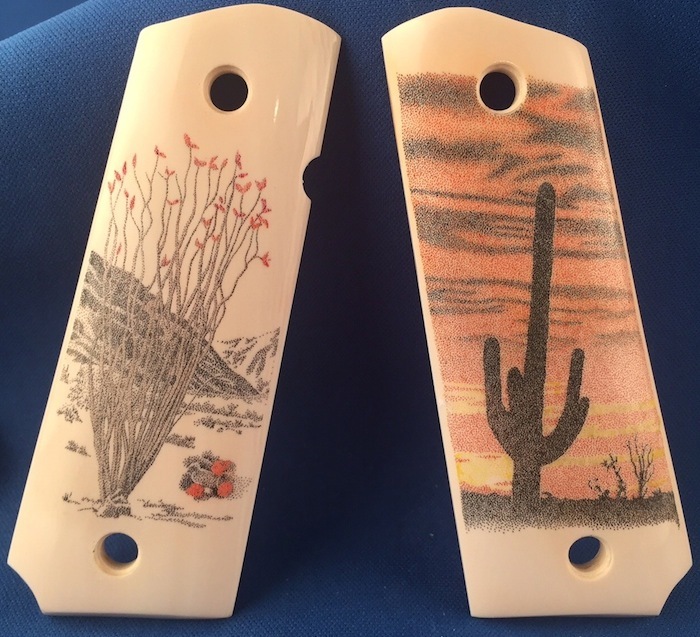 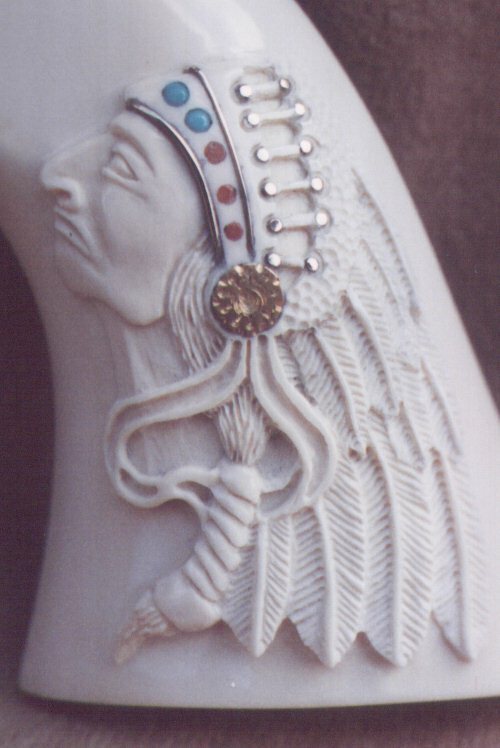 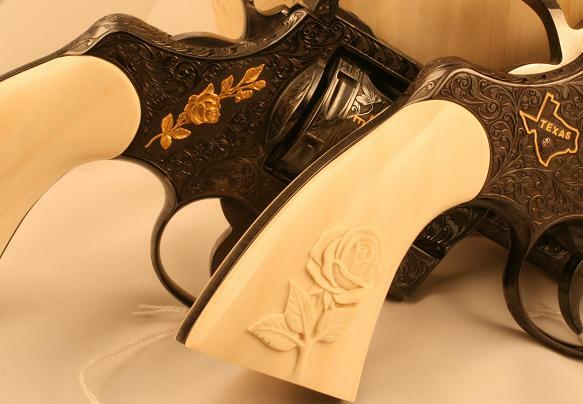 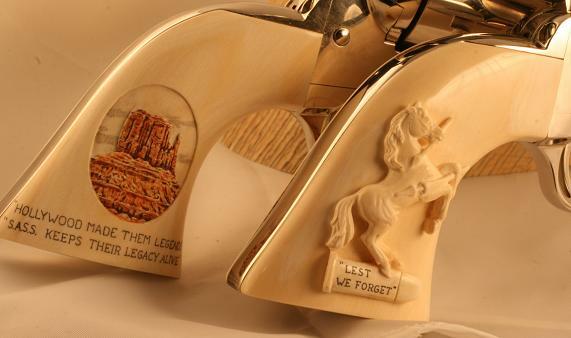 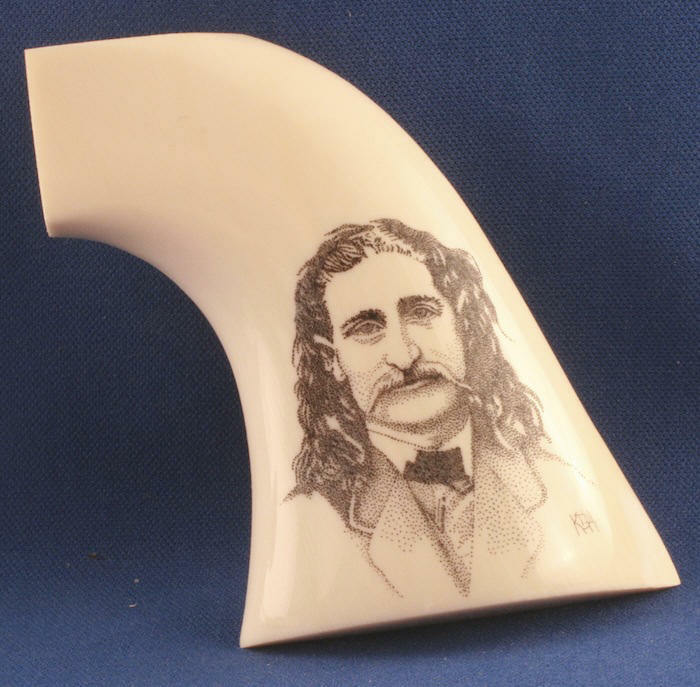 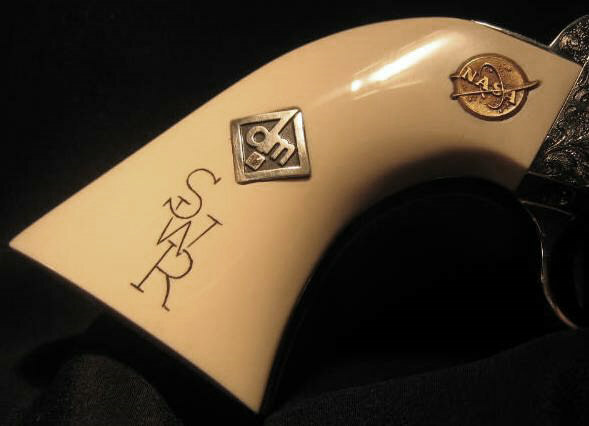 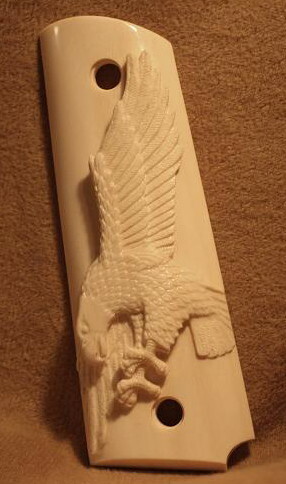 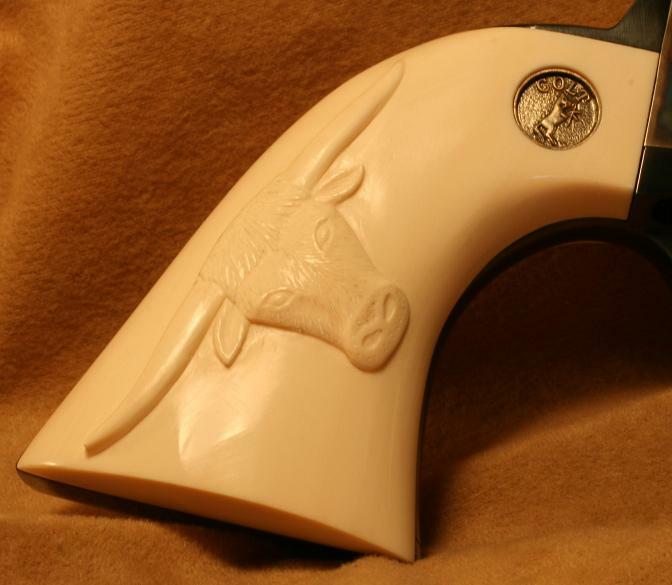 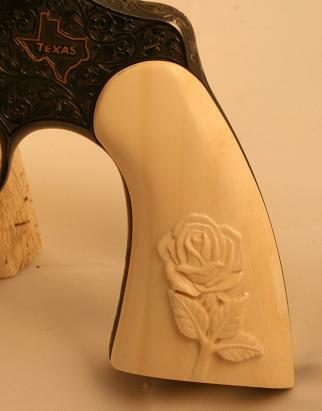 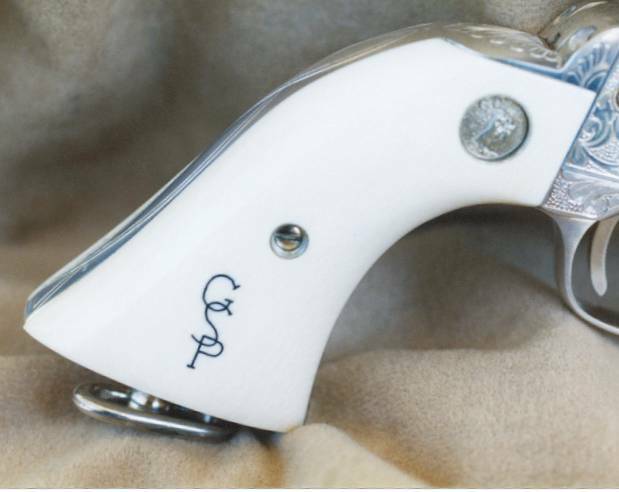 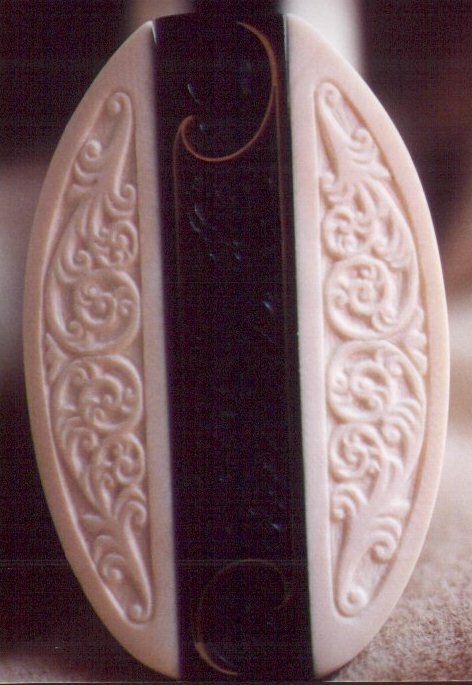 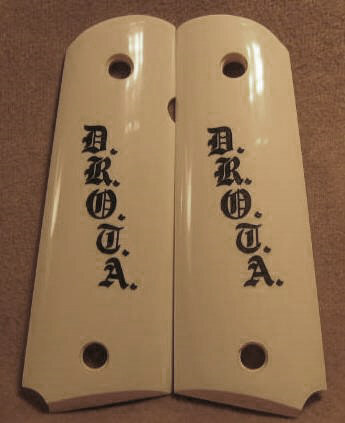 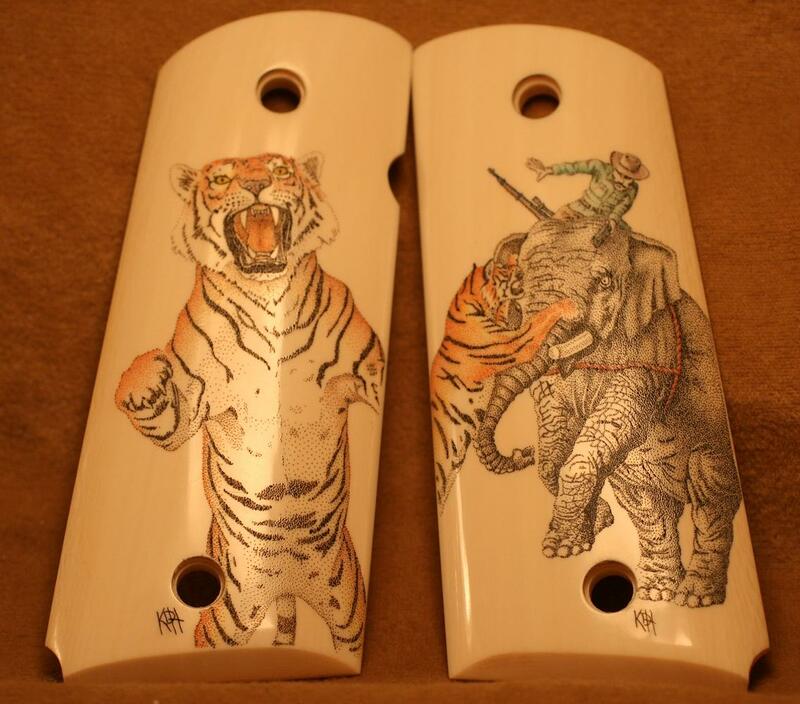 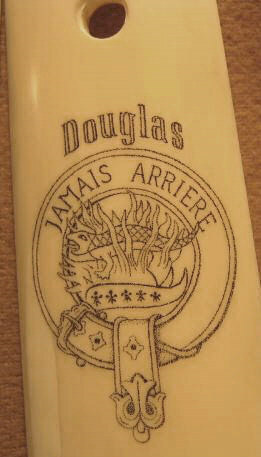 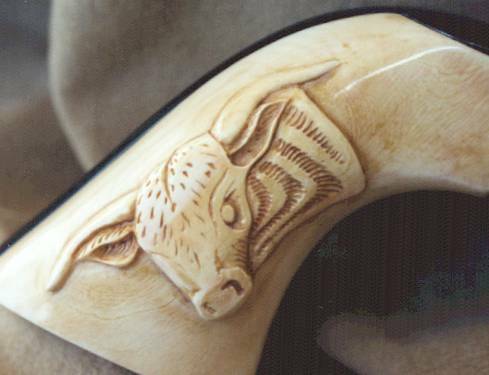 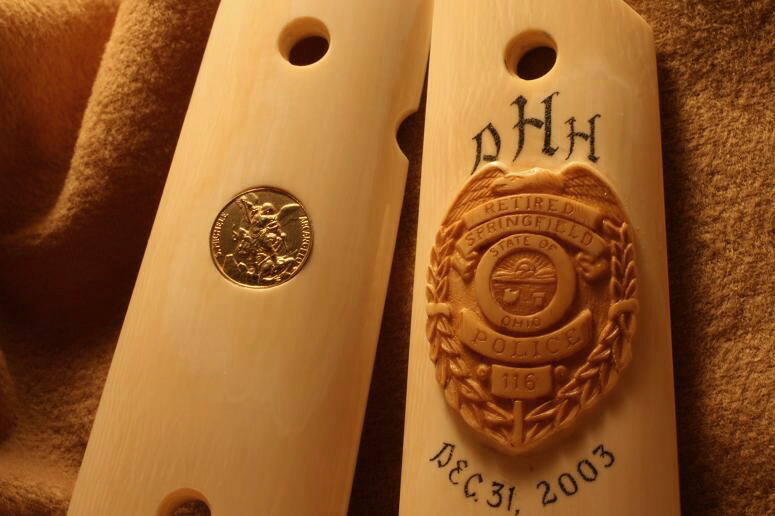 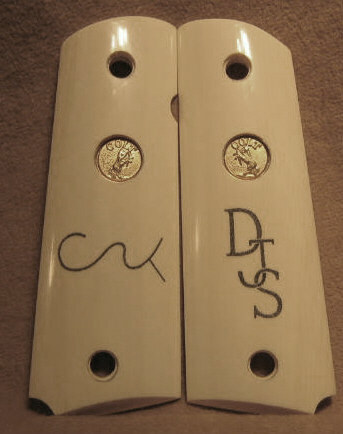 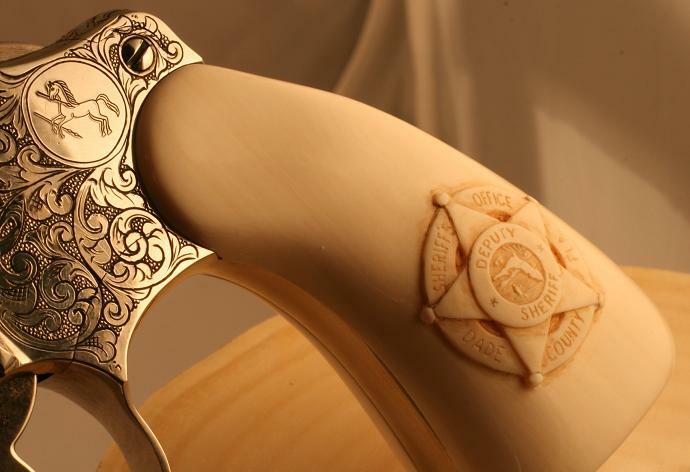 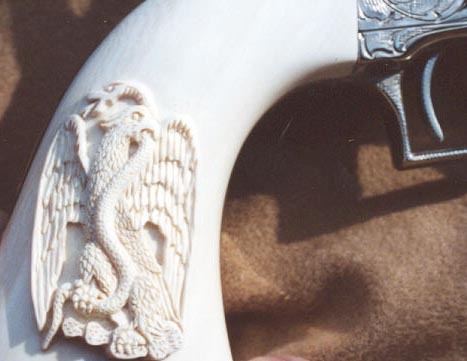 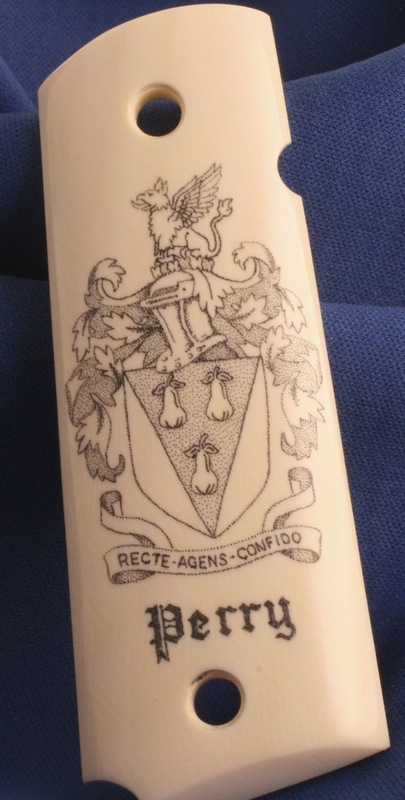 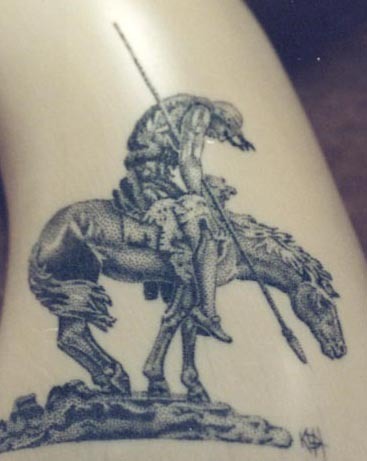 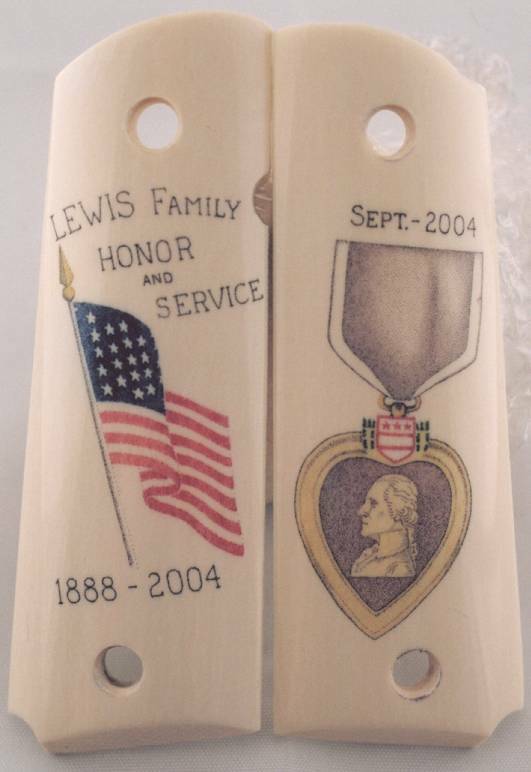 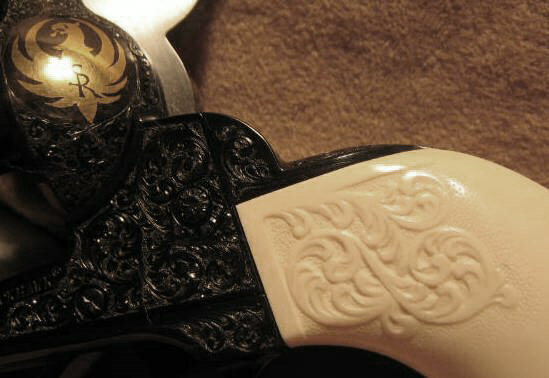 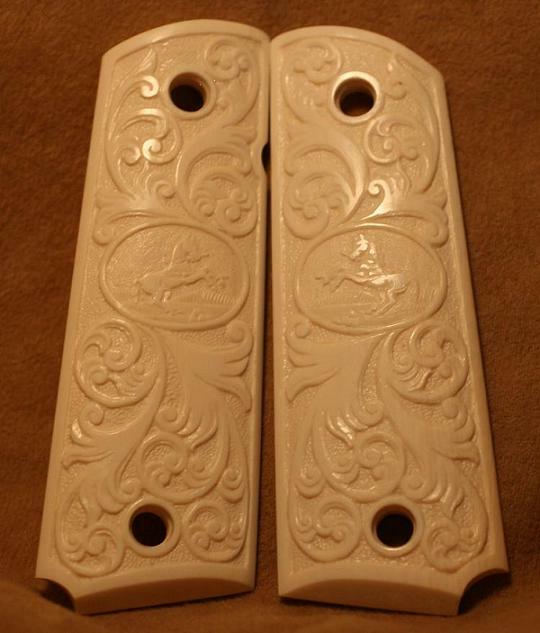 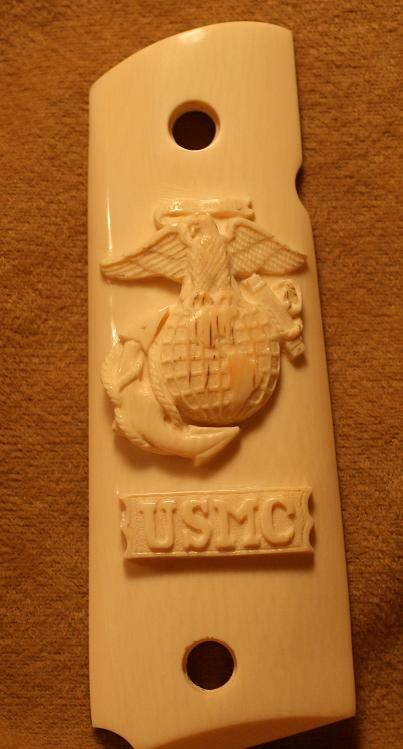 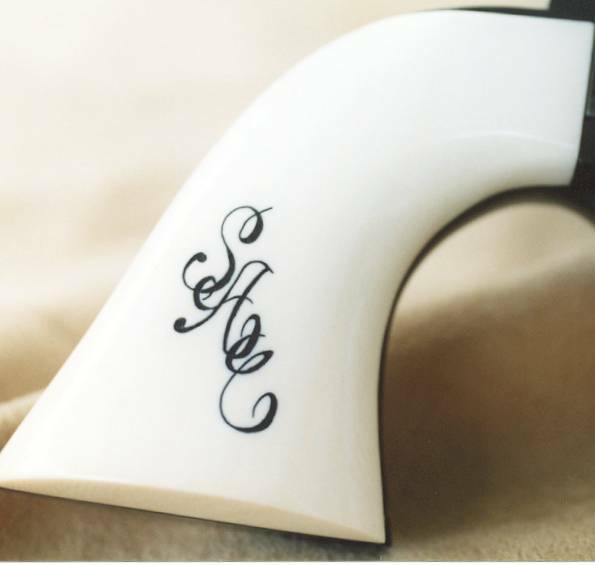 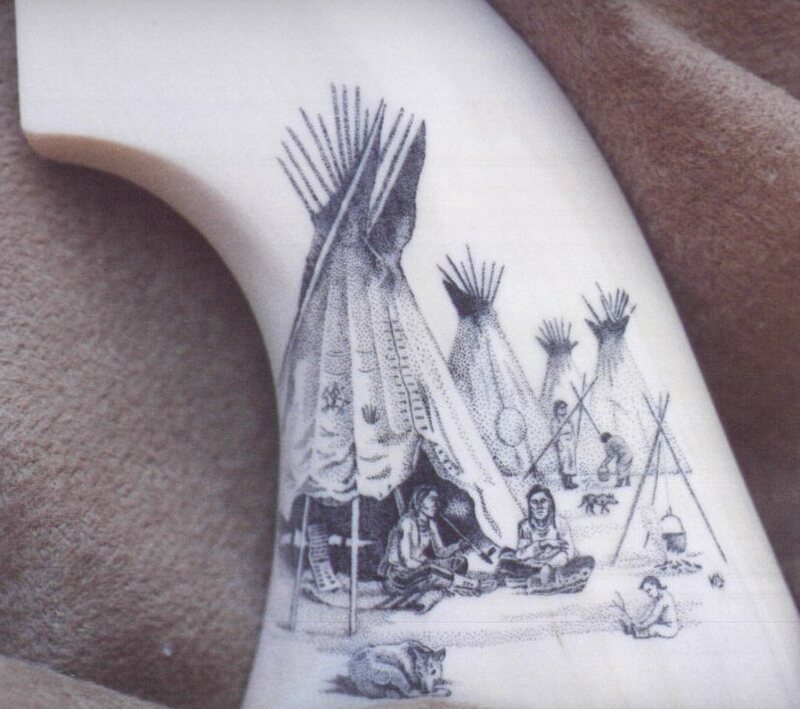 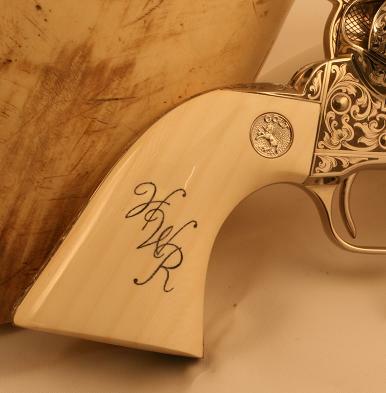 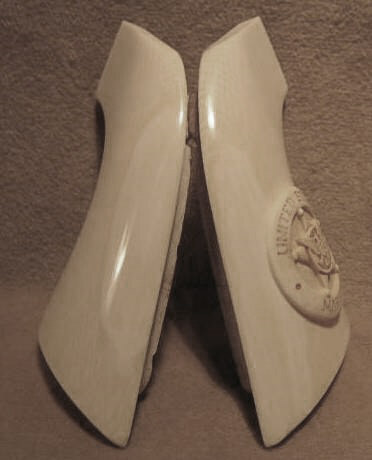 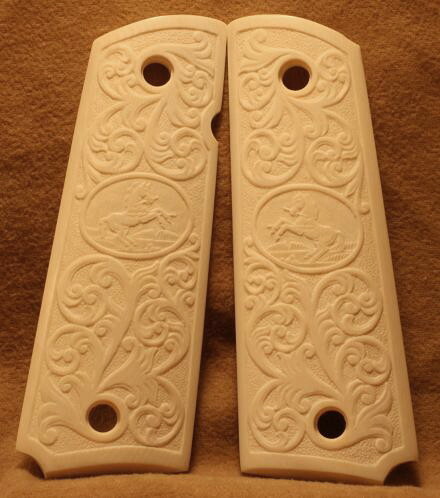 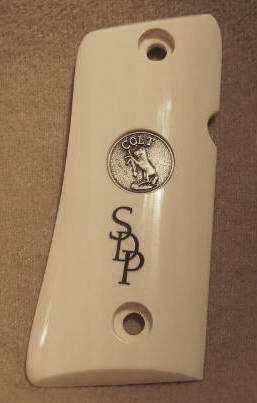 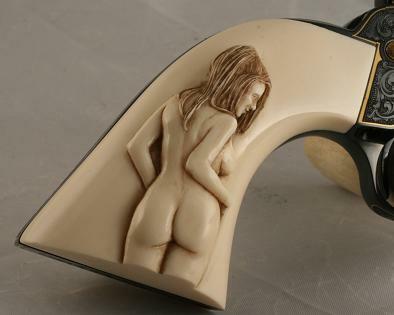 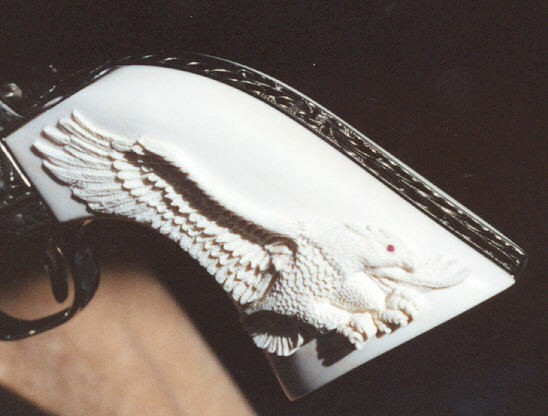 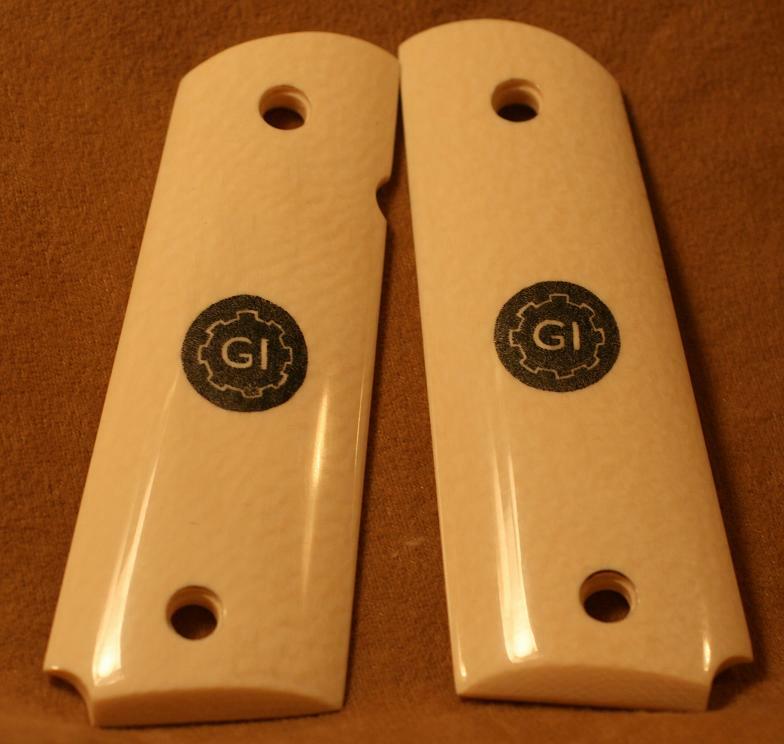 For grips with carving or scrimshaw you must contact us for prices. 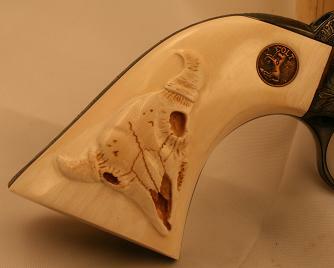 For any other pricing information just click on the price list icon. 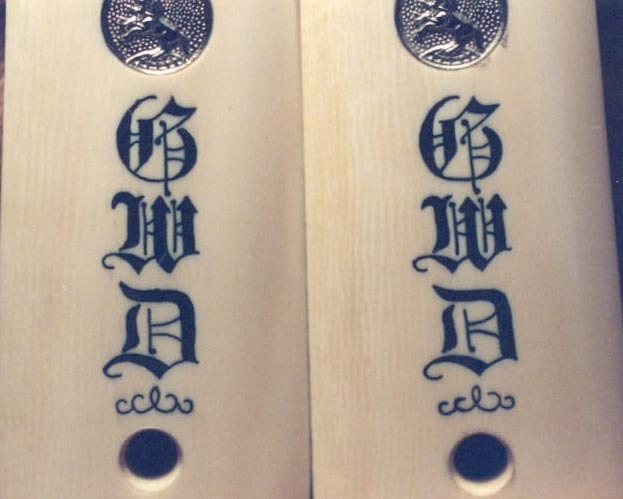 Returns: We very rarely have any of our products returned. 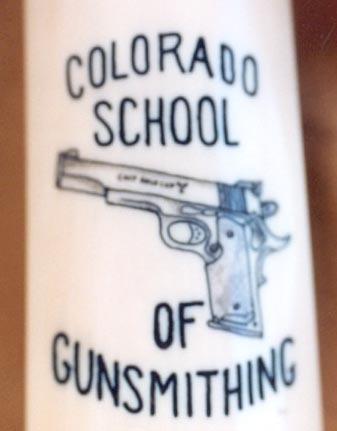 As a mater of fact in over 20 years we have NEVER had a gun returned. 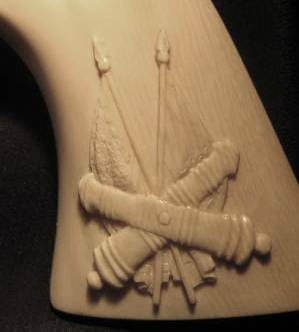 In the rare event however if a product is returned, full credit will be issued minus the original shipping charges and a 10% restocking fee. 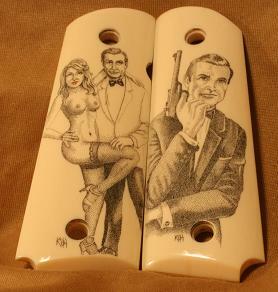 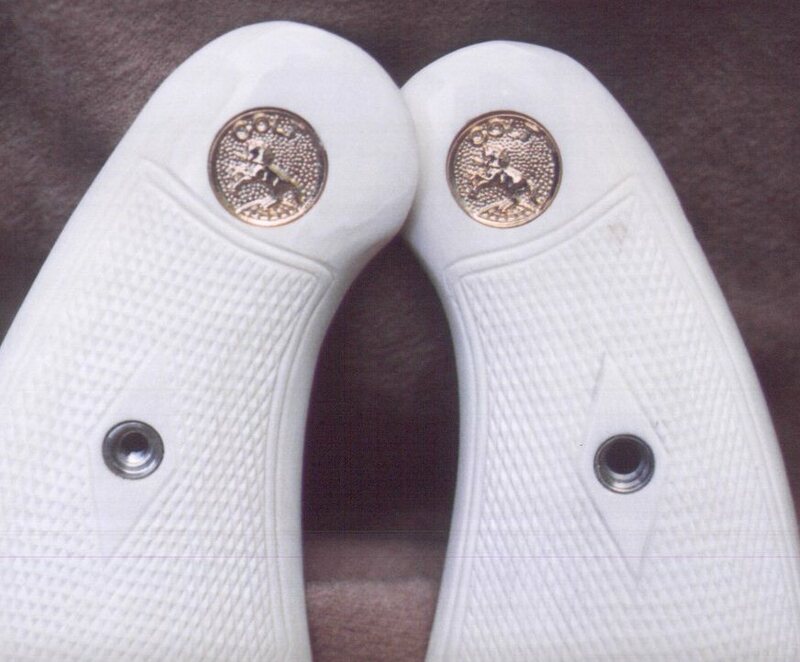 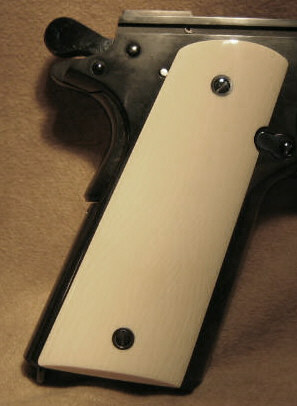 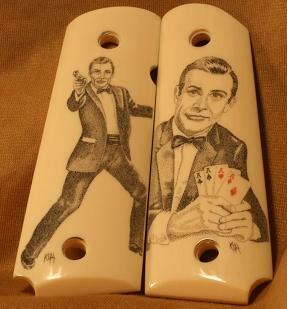 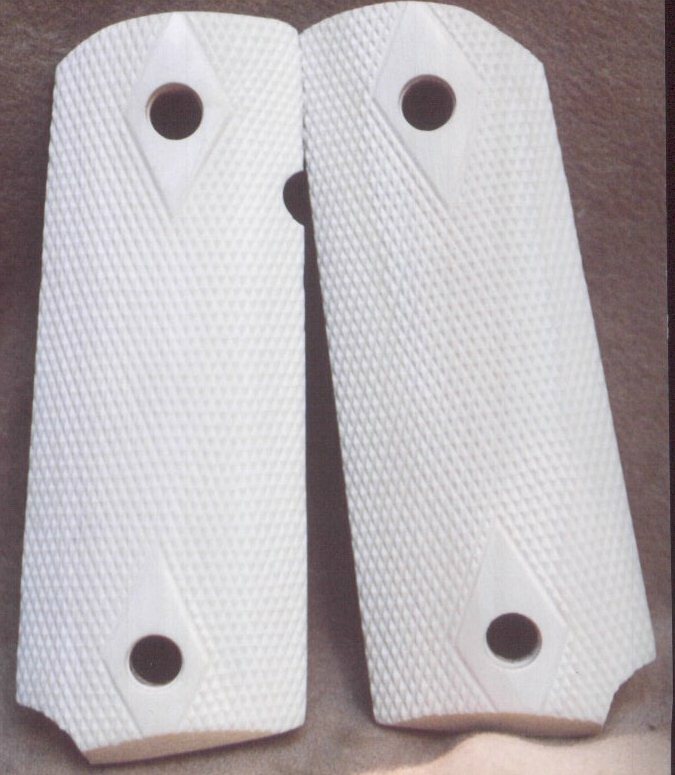 If you need grips for a 1911 or 1911 style gun, we do not require the gun to make the grips. 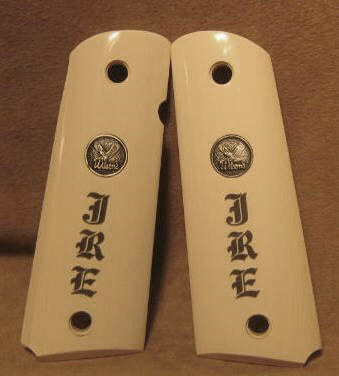 We have several slave receivers here to assure a perfect fit. 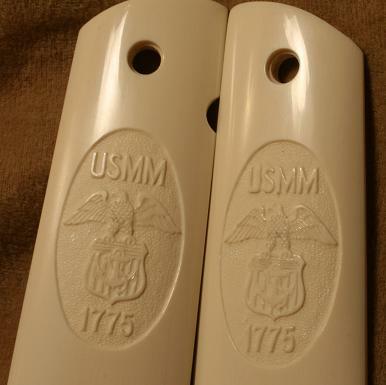 Please be sure to tell me what configuration you would like for your SAA grips. 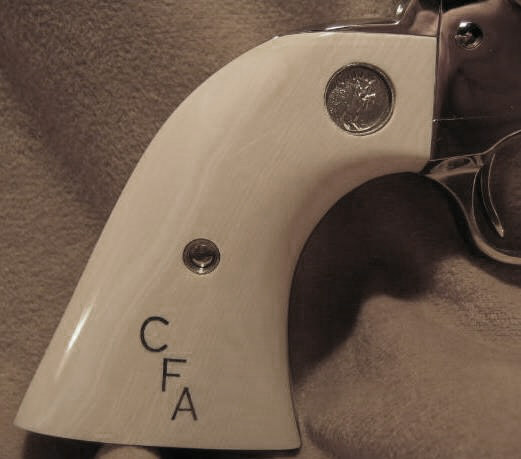 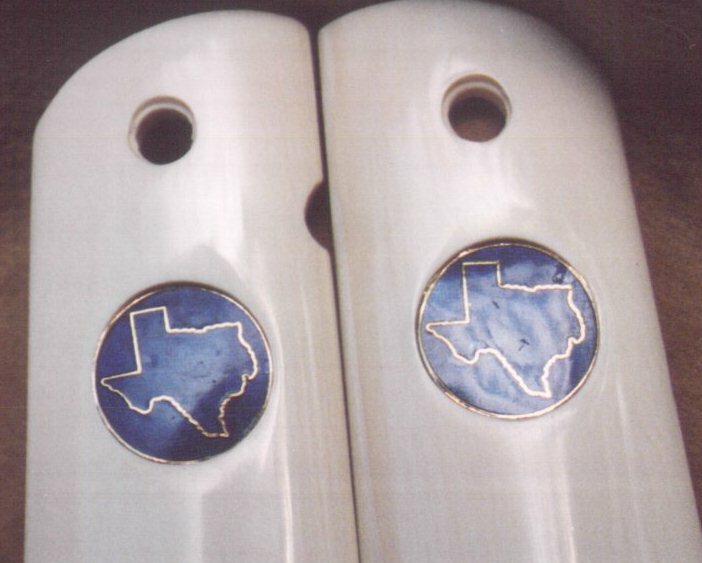 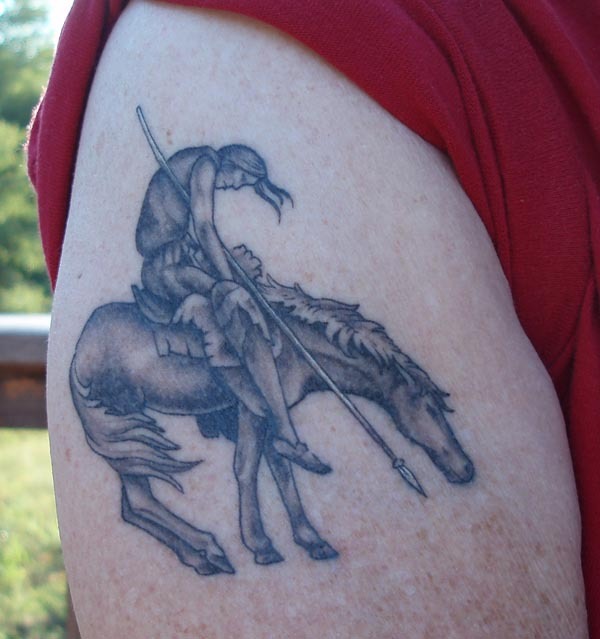 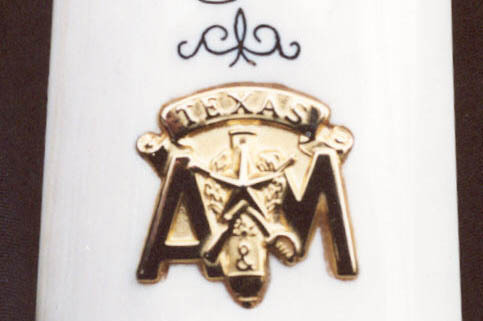 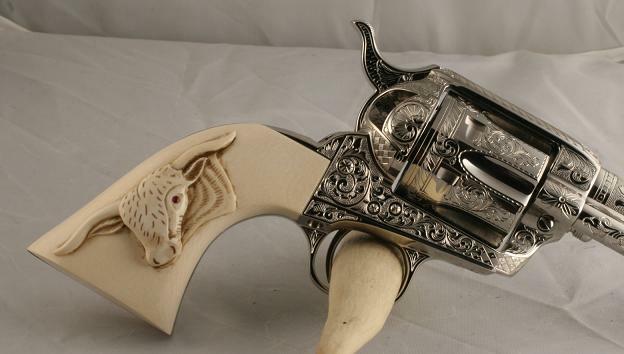 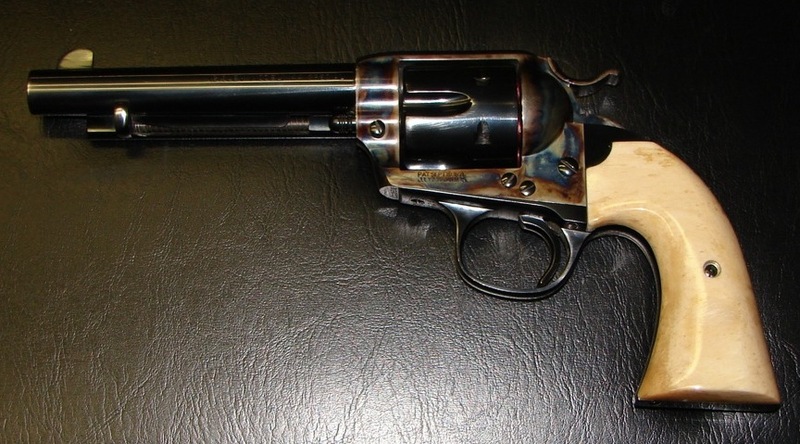 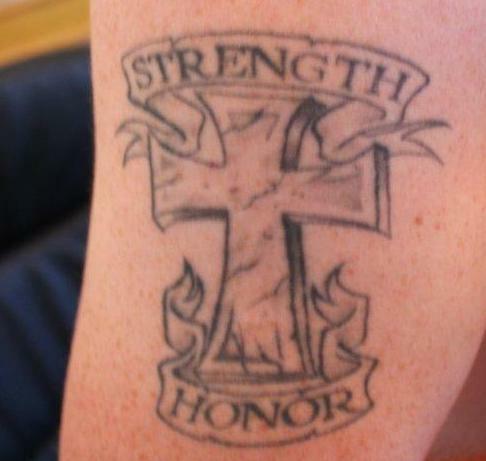 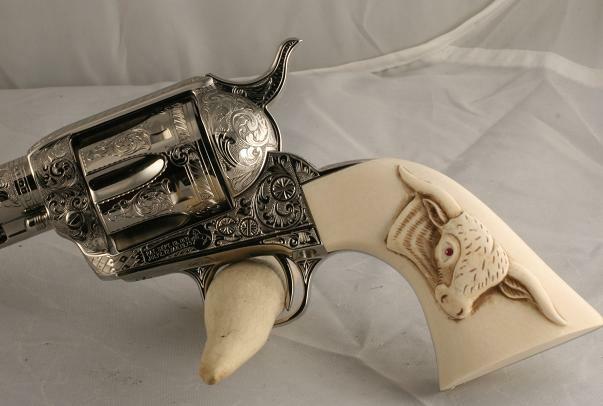 That is one piece, two piece, with or without Colt medallions. 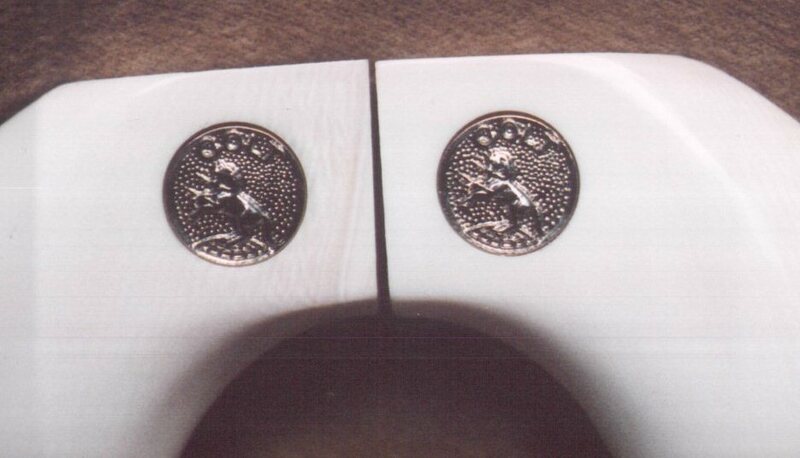 If yes on the medallions please specify what style. 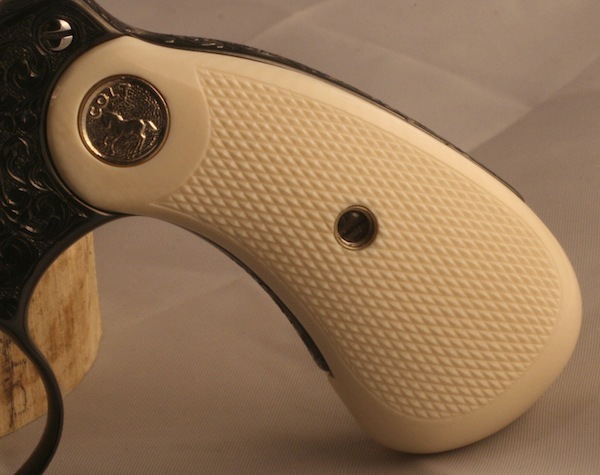 If you want, you can keep the cylinder and the existing grips, but I need the frame, backstrap, and trigger guard. 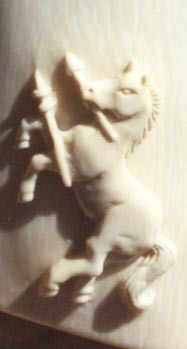 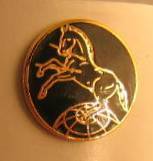 You can ship UPS-Next Day Air or Federal Express but NOT by U.S. Mail. 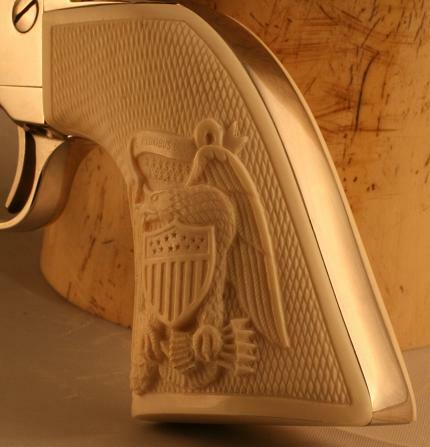 The reason for no license requirement for you is we are not doing a transfer...you are shipping your gun to me so I may perform work on it. 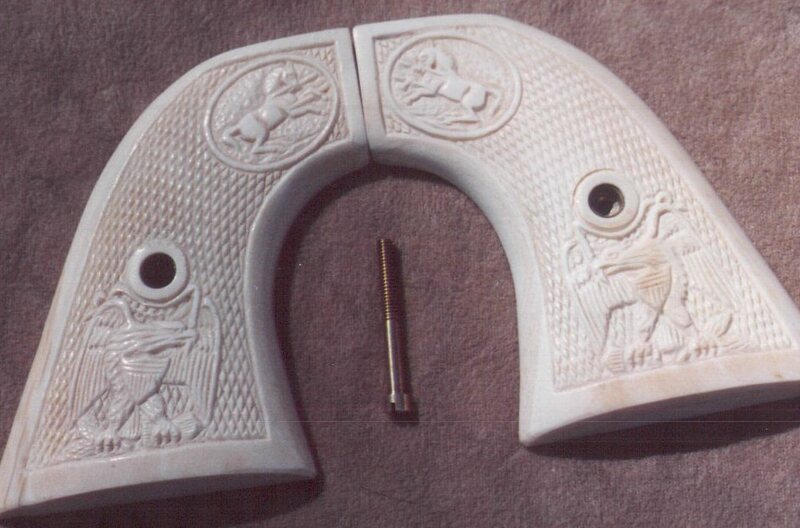 Therefore it is referred to as a "Repair and Return". 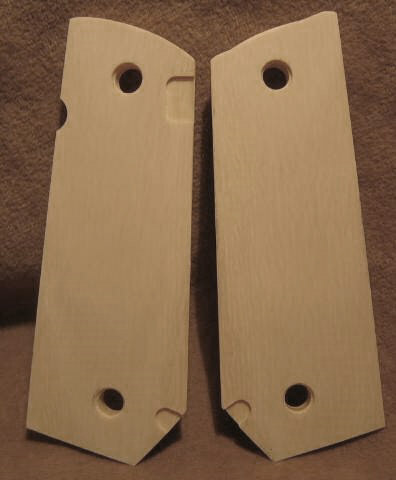 This procedure is in strict compliance with the BATF guidelines. 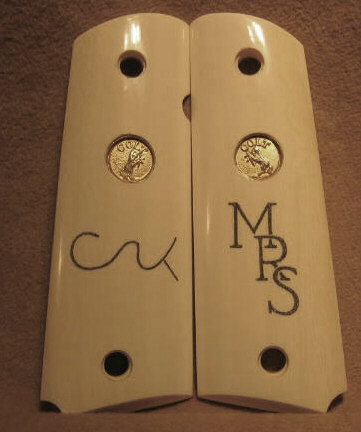 Payment can be made by cash, certified check, money order, Visa, MasterCard or personal check.